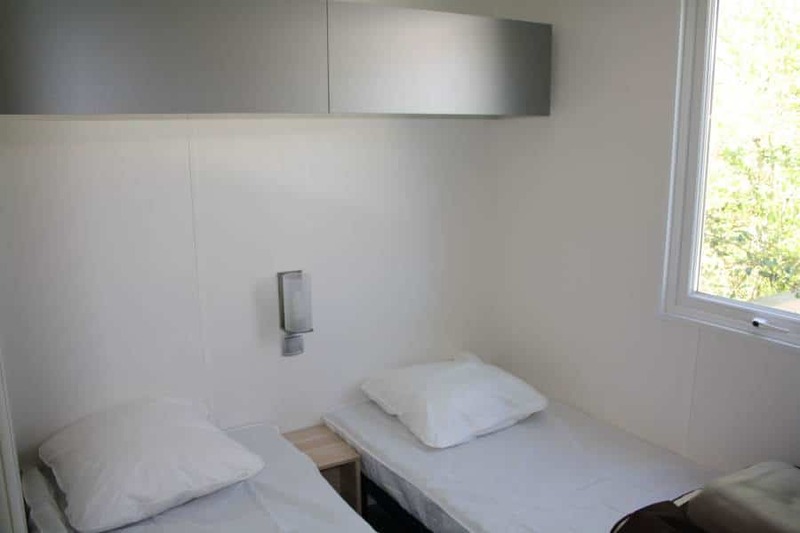 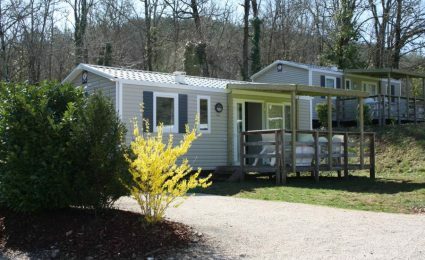 Among our accommodations, you can stay in one of our mobile homes stationed in its spacious spot. 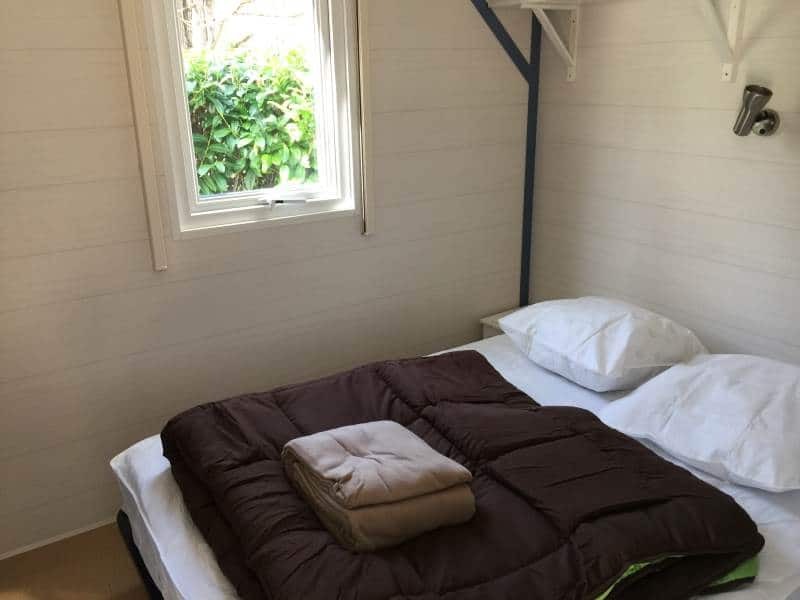 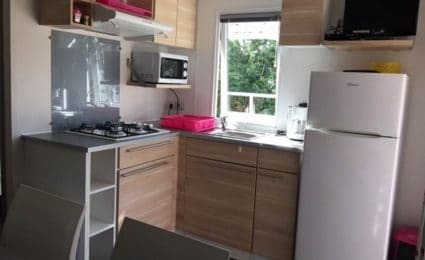 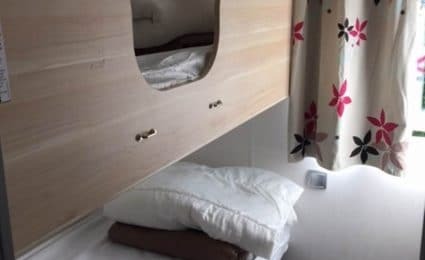 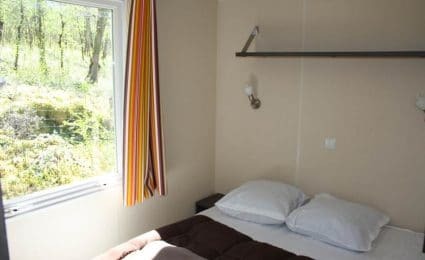 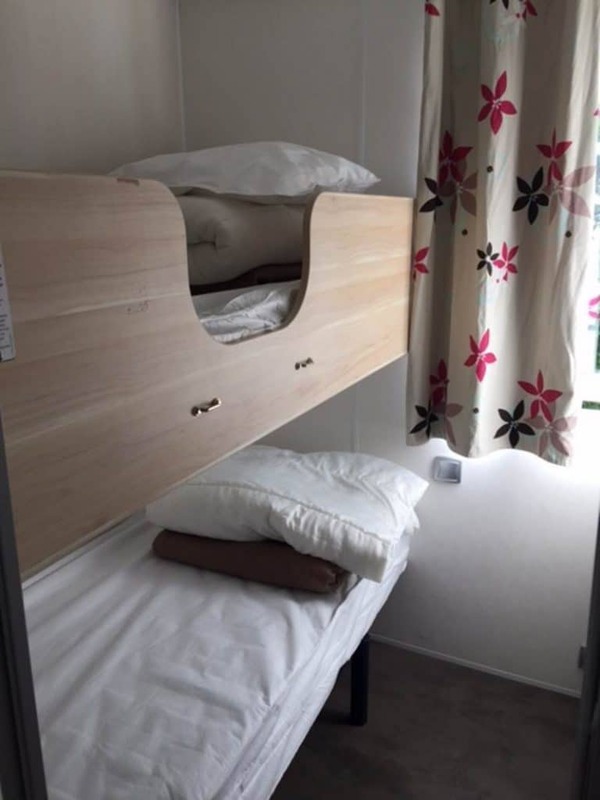 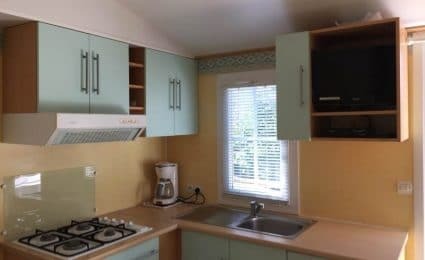 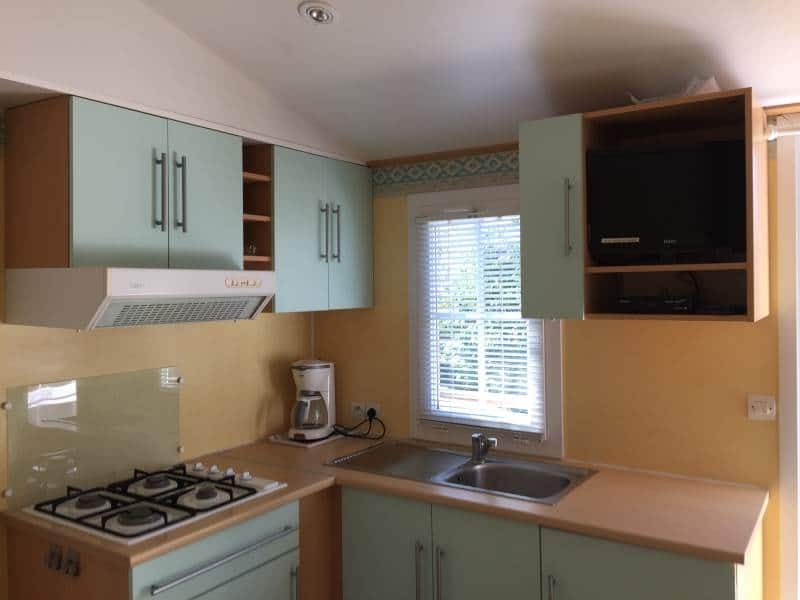 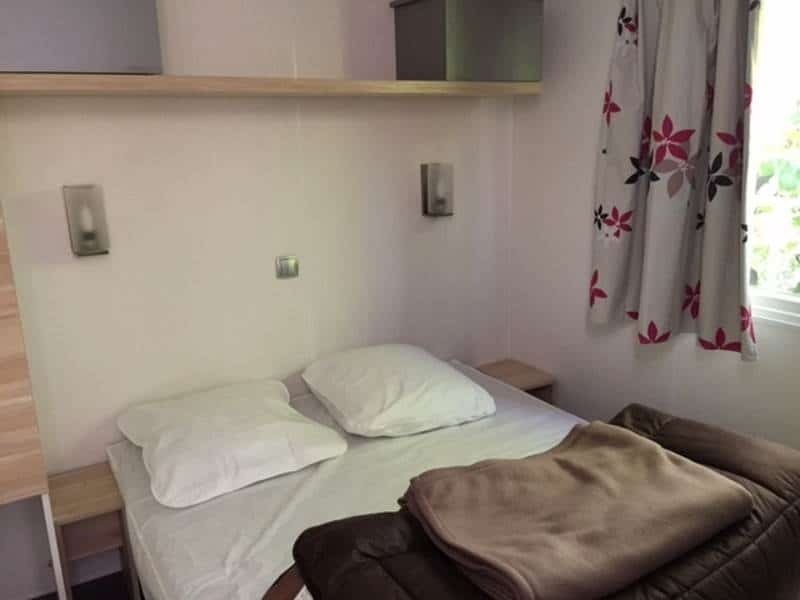 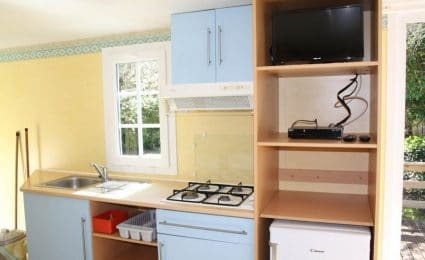 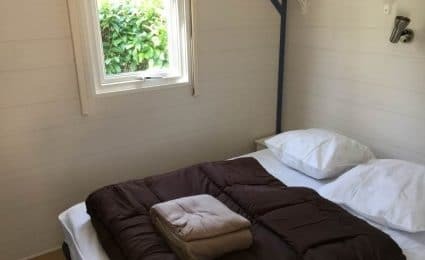 Depending on your choice, all of our holiday rentals are equipped with a bathroom/shower, wc, kitchen with gas hobs, microwave, fridge, coffee maker, plates, pots and pans for 4-8 people. 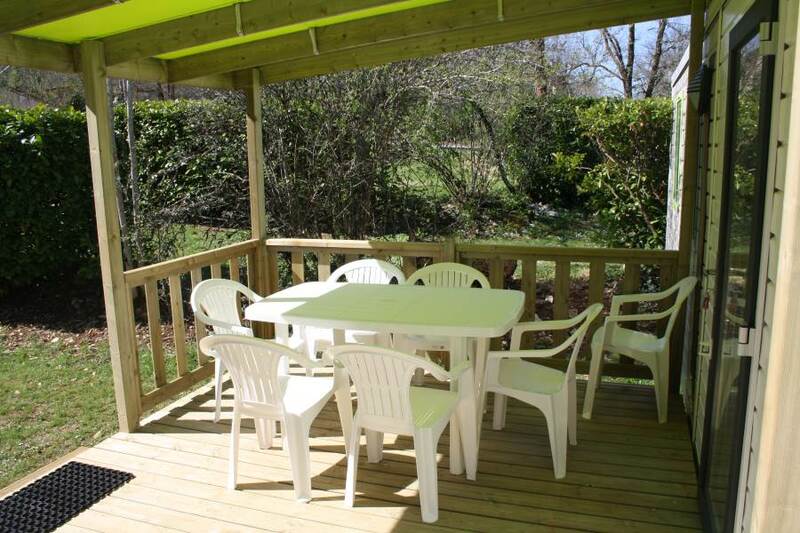 Outsidethere is a terrace with parasols and garden furniture. 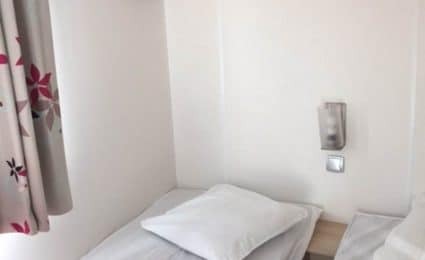 Pillows and covers are provided you just need to bring sheets. 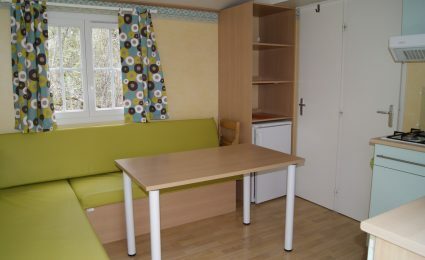 It is also possible to rent a baby bed and high chair. 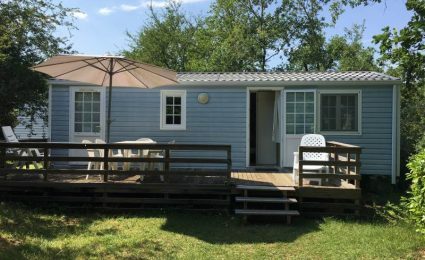 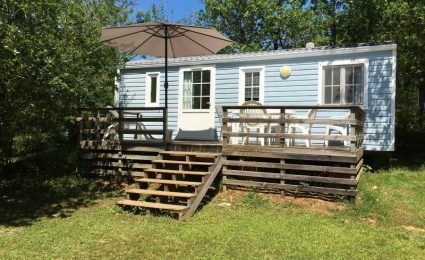 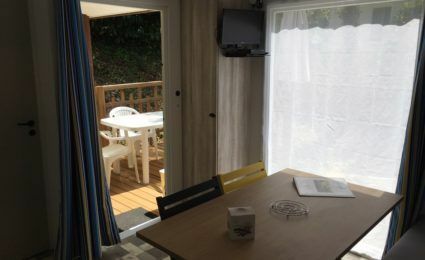 Mobile Home Bermudes Trio - 3 bedrooms + Covered outdoor terrace + TV. 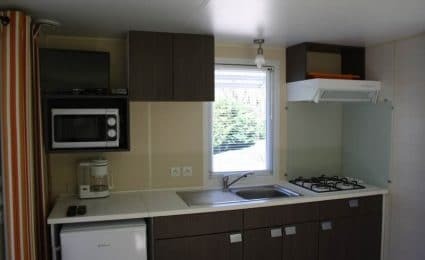 Interior surface 31m2 + terrace 4,50x3m (13,5m2) whose 3x3m (9m2) covered. 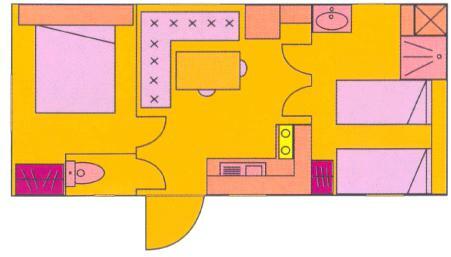 Living room // TV included // Large refrigerator. 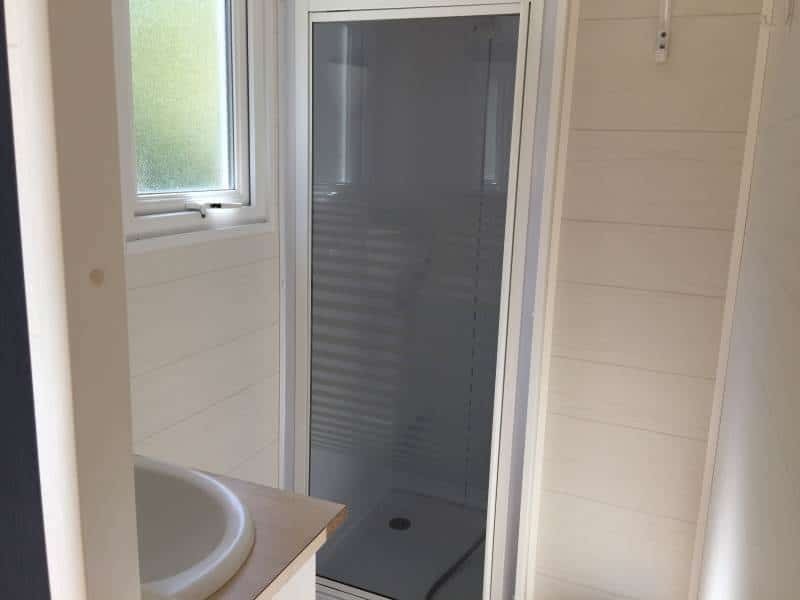 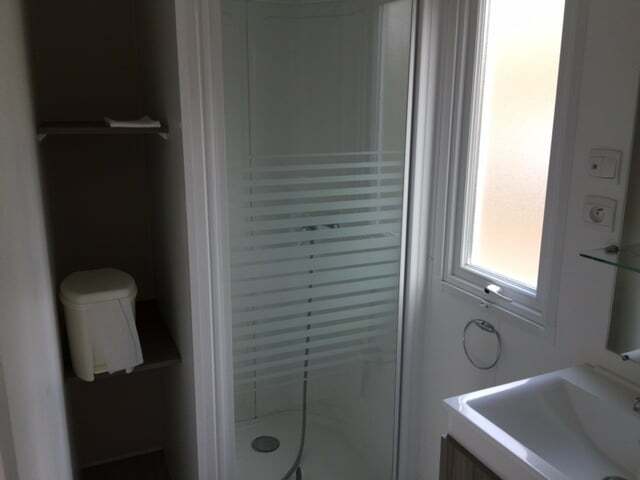 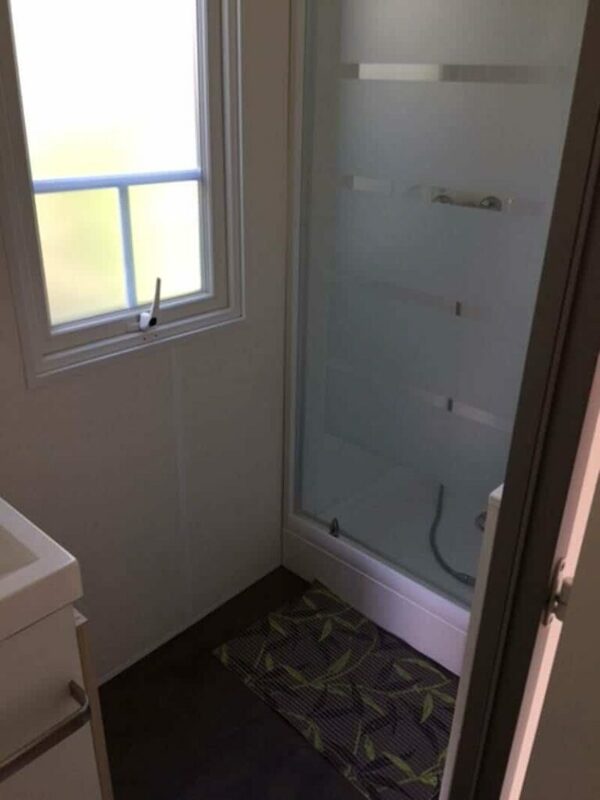 Large shower // Towel Dryer. 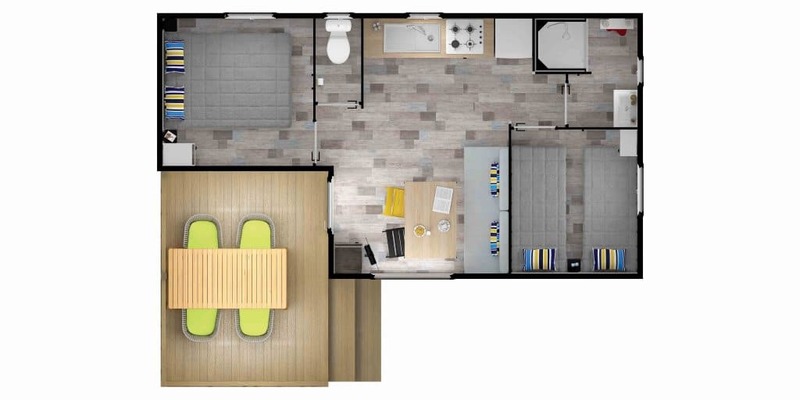 1 bedroom with bed 160×200 // 2 bedrooms with beds 80×190. 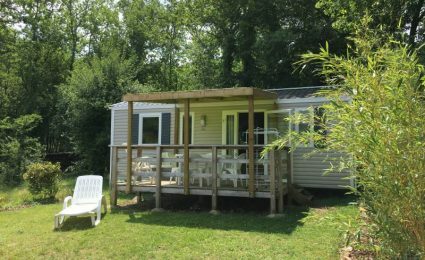 Mobile Home O'Hara 884 - 3 bedrooms + Covered Terrace + TV. 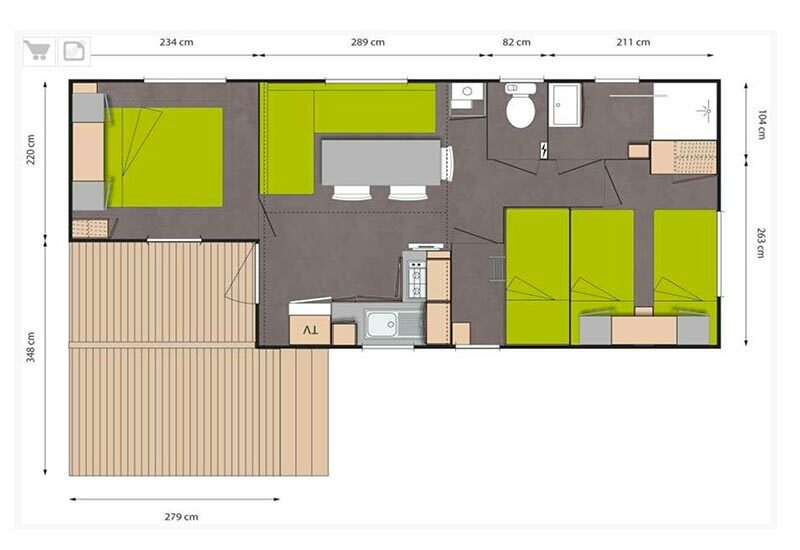 Interior surface 33m2 + Large pitch + terrace 2,40x7m (16m2) whose 3x3m (9m²) covered. 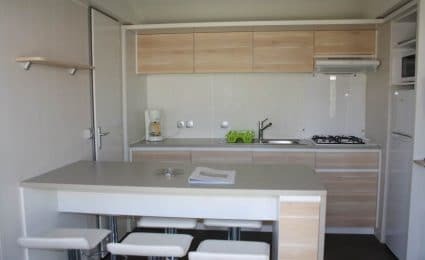 Central Island in the kitchen // Living room // TV included // Large refrigerator. 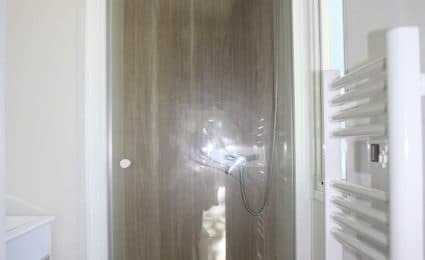 Large shower // Hair Dryer. 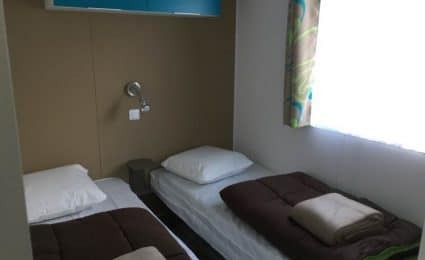 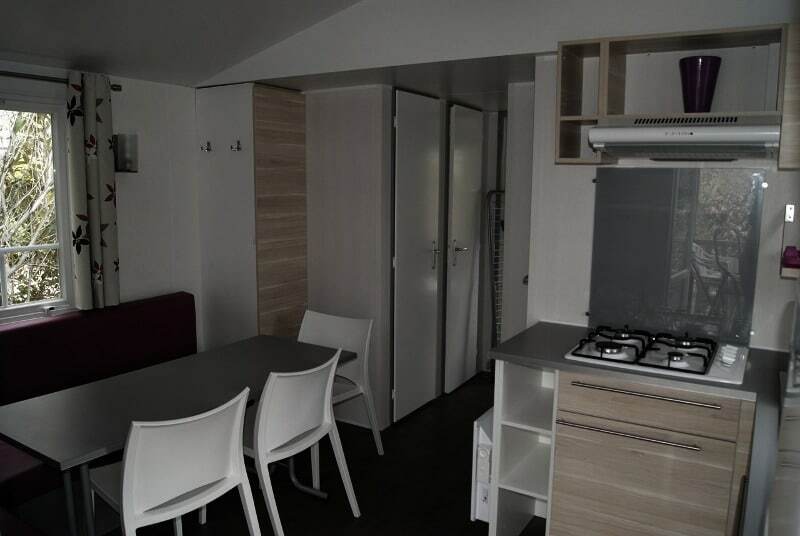 1 bedroom with bed 140×190 // 2 bedrooms with beds 80×190. 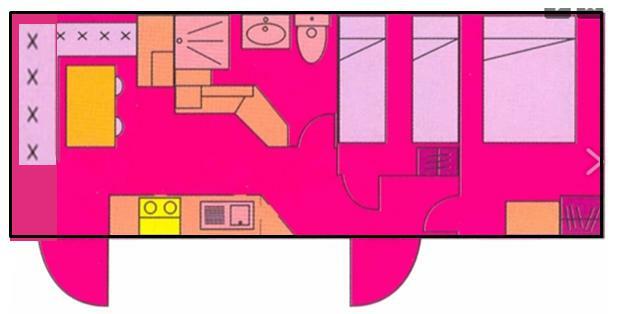 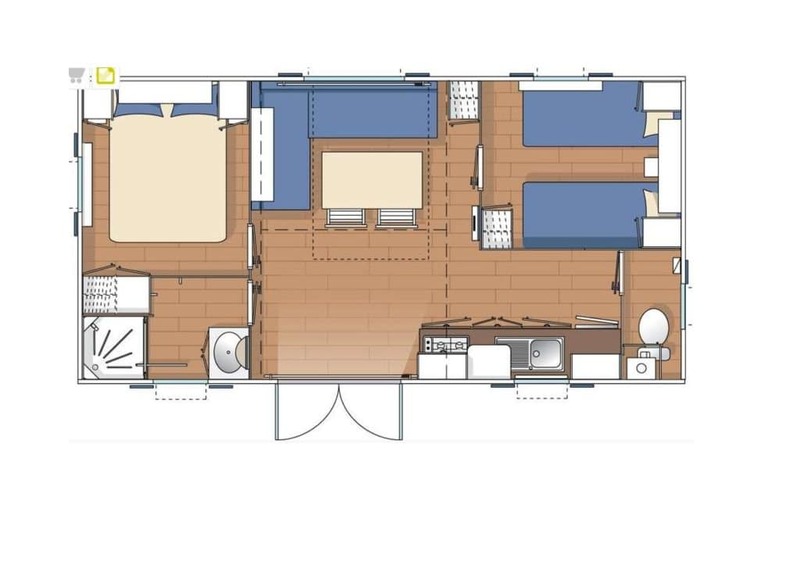 Mobile Home 834T - 3 bedrooms + Integrated Covered Terrace. 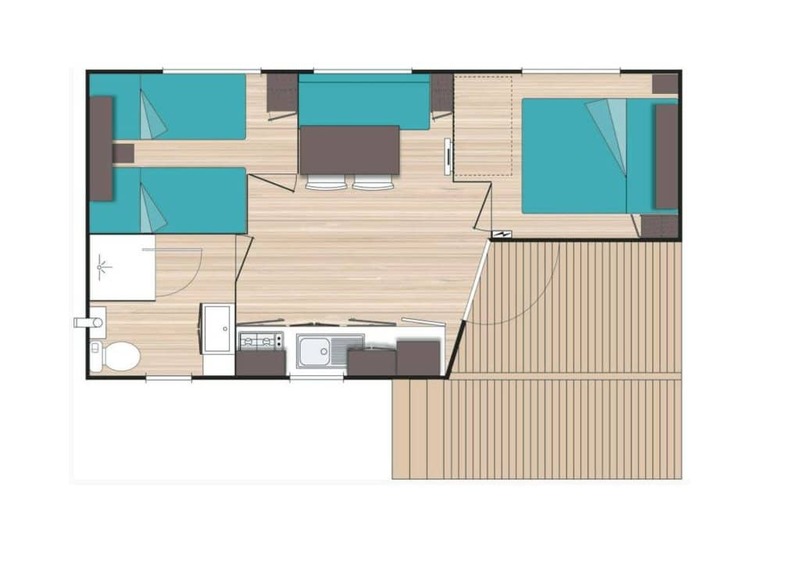 Surface with terrace 31.10m² (part is covered). 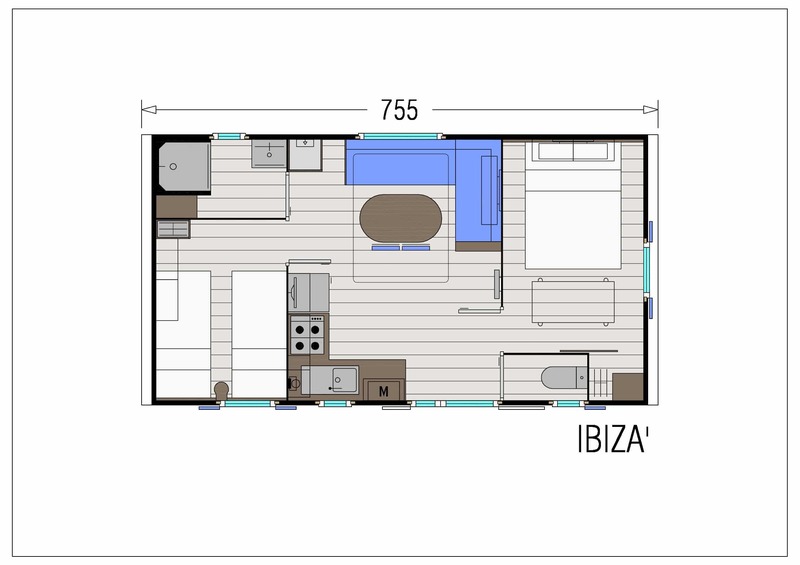 Mobile Home Ibiza - 2 bedrooms + Covered Outdoor Terrace. 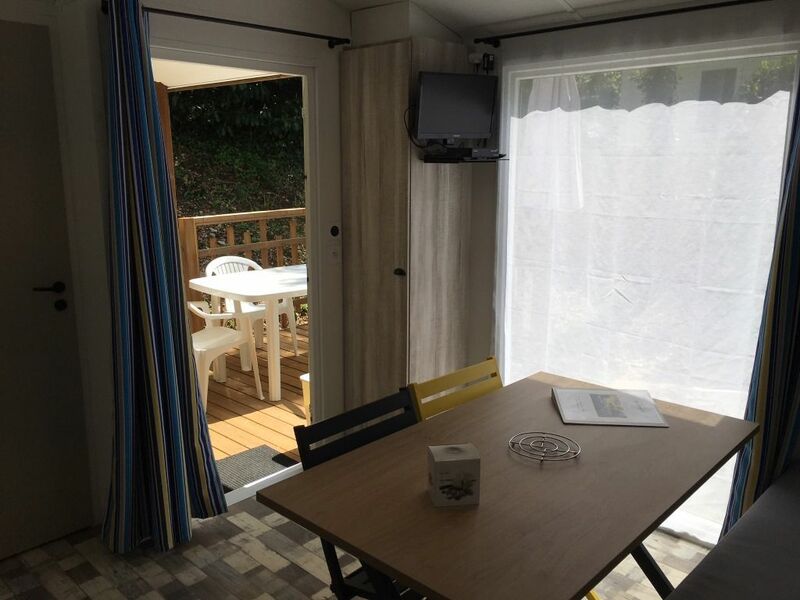 Surface 27.5m² + Terrace covered. 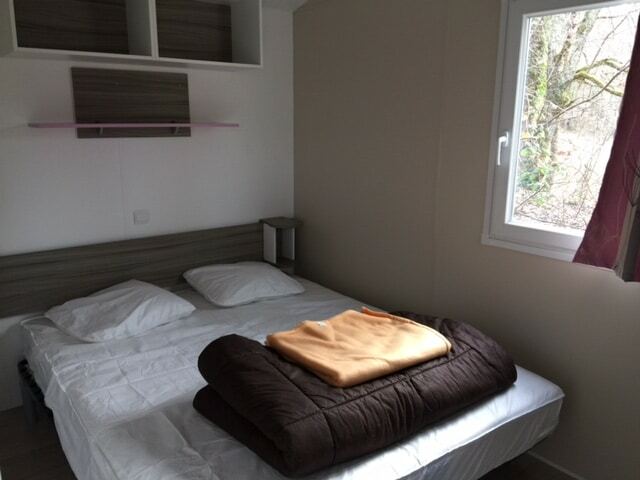 1 bedroom with double bed 160×200. 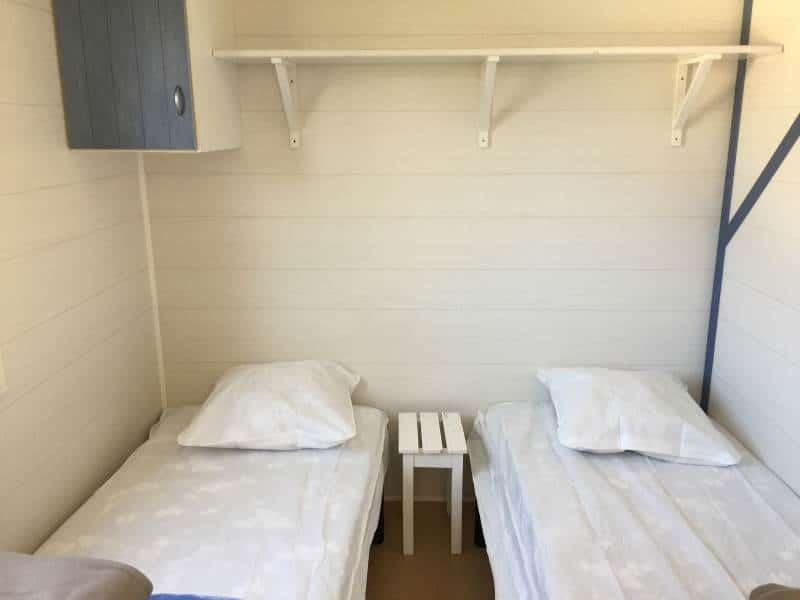 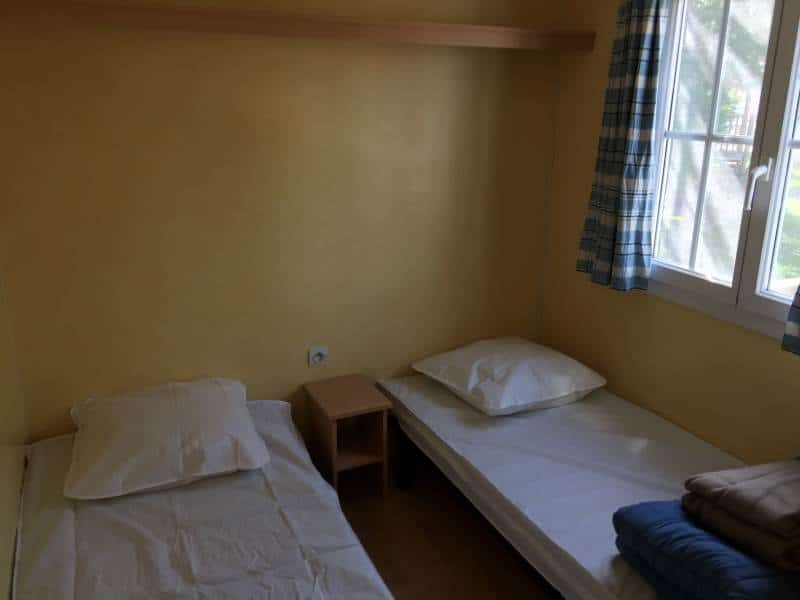 1 bedroom with single beds. 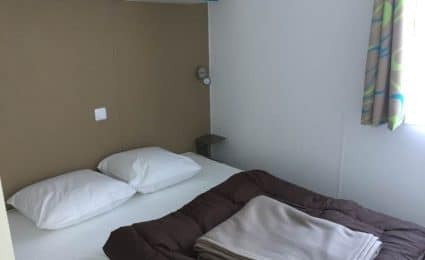 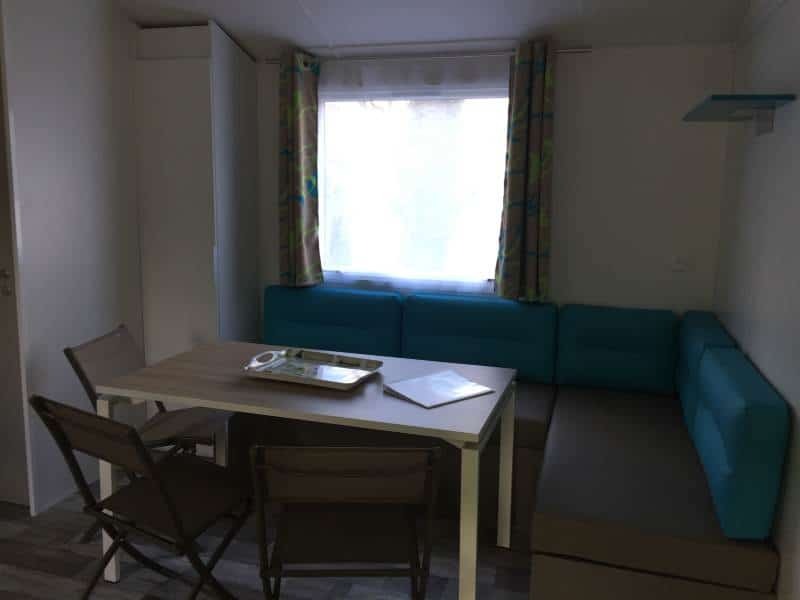 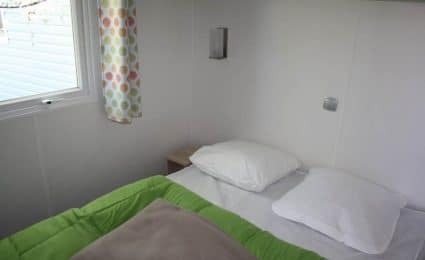 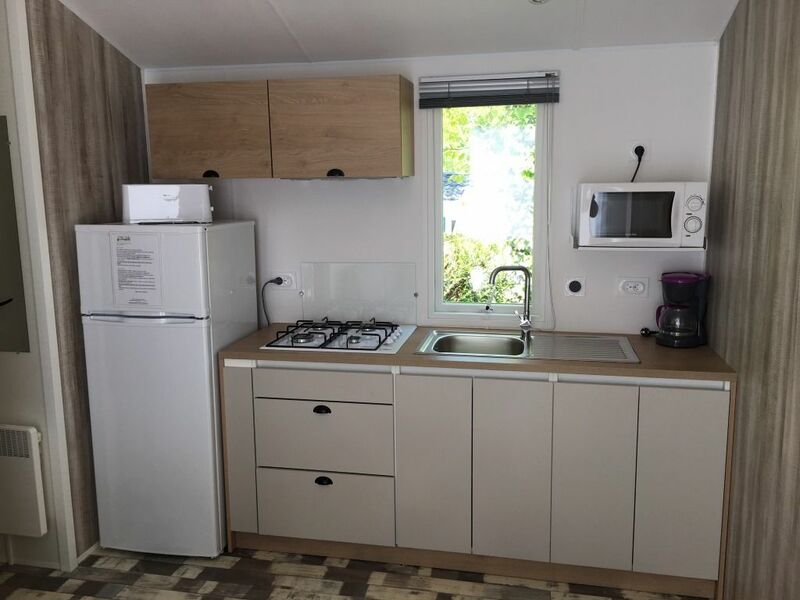 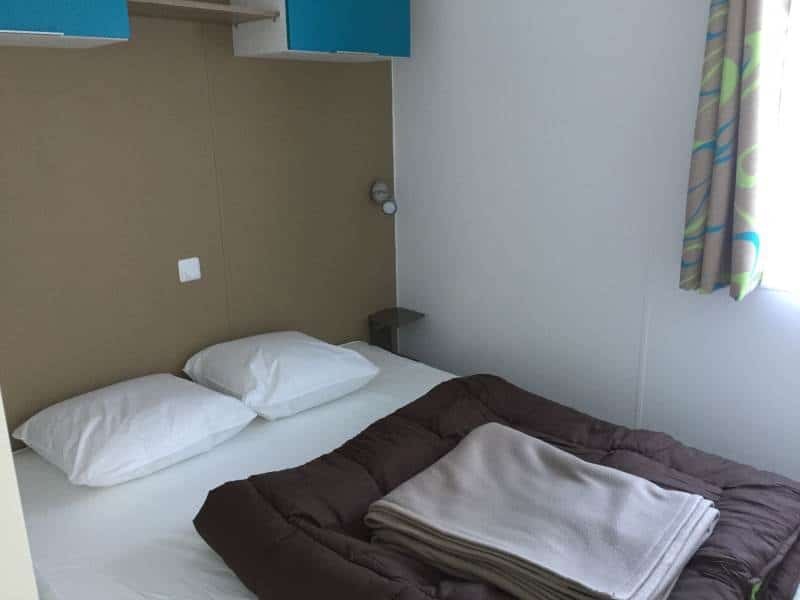 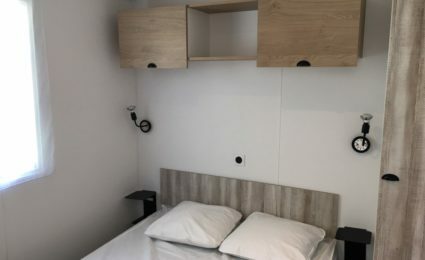 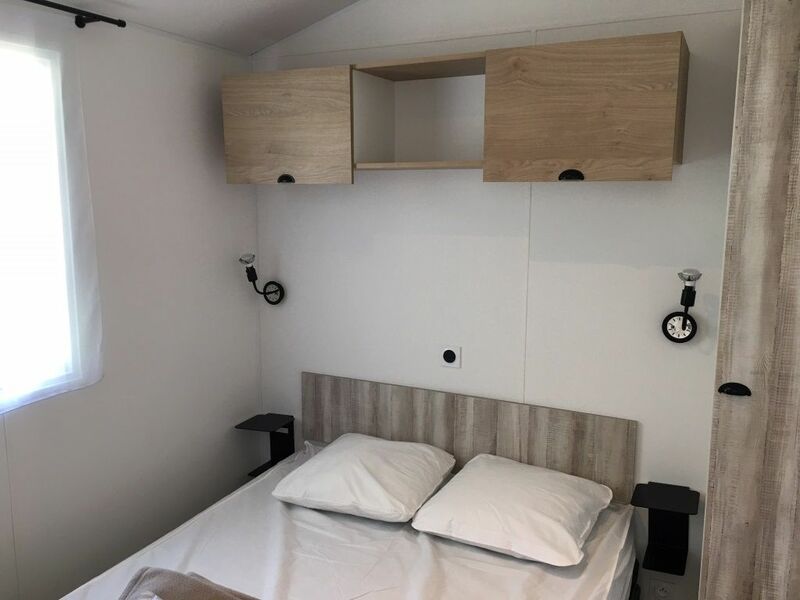 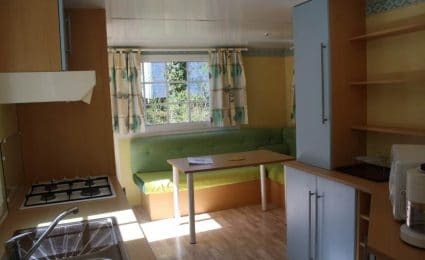 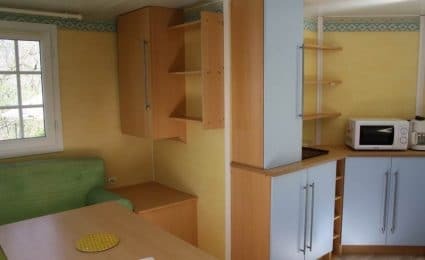 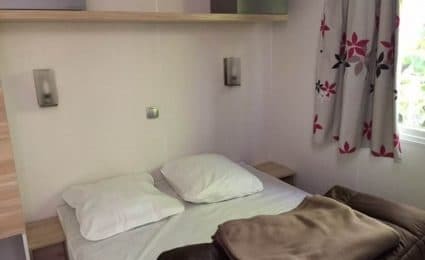 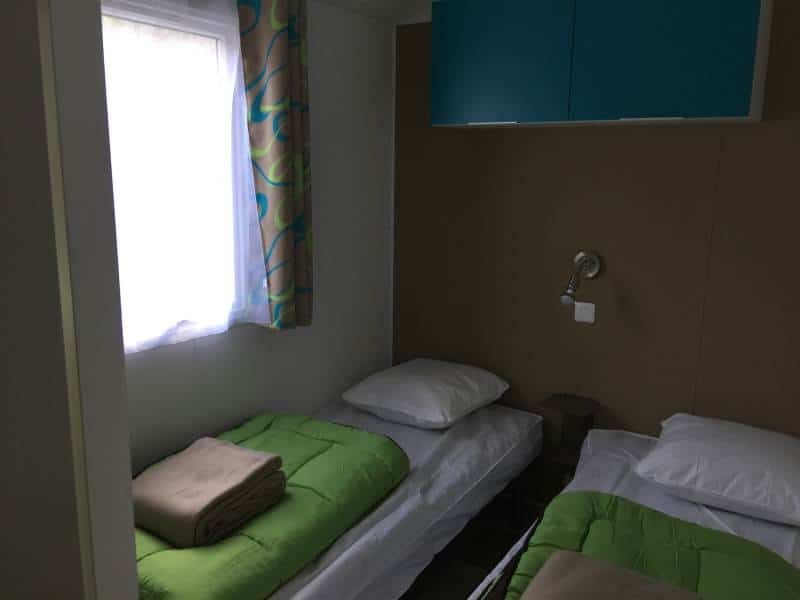 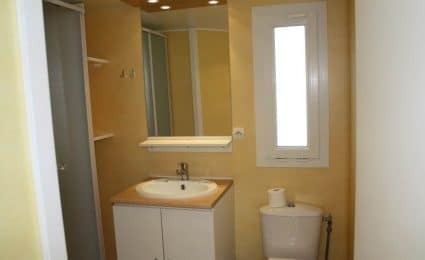 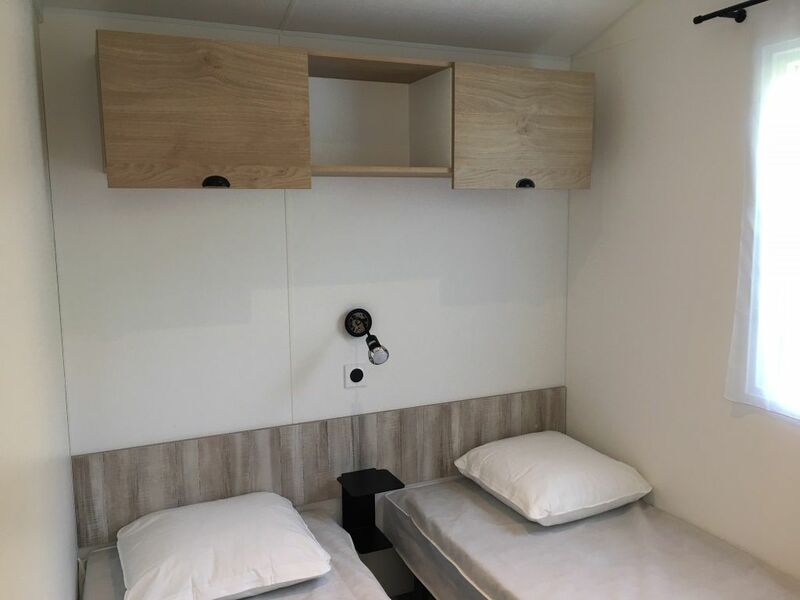 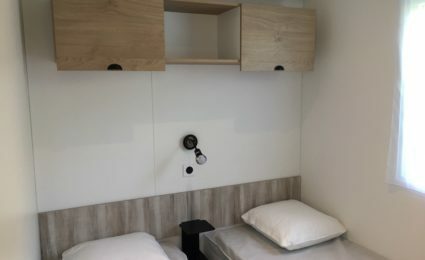 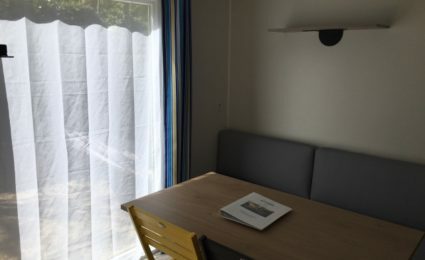 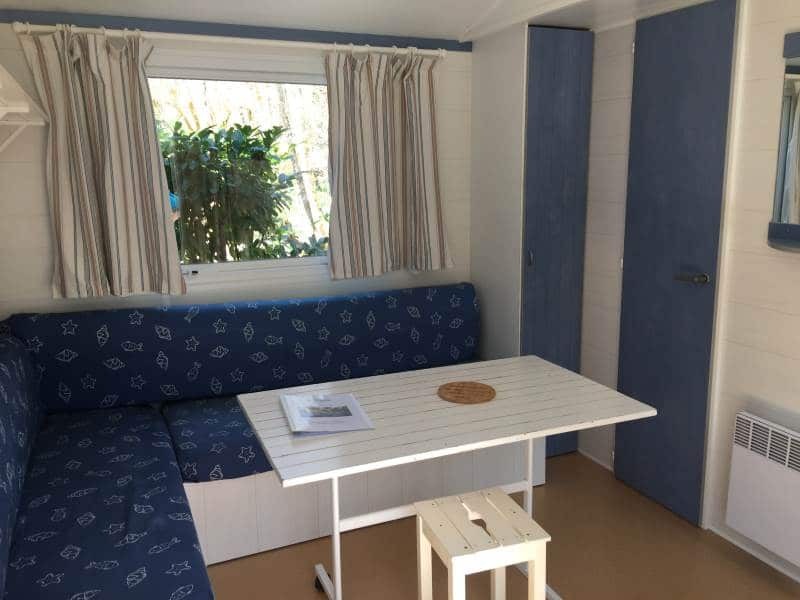 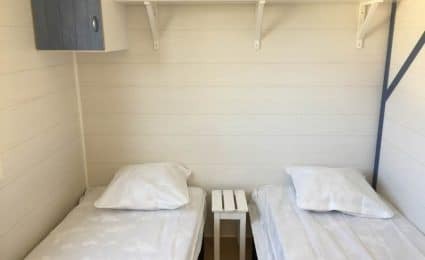 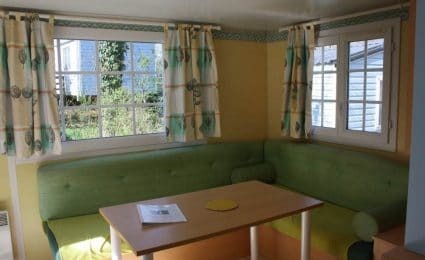 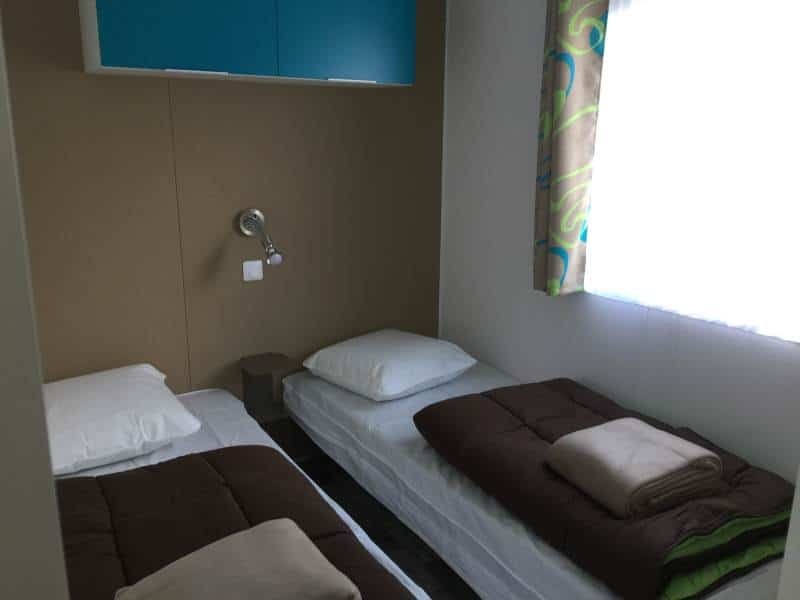 Mobile Home Malaga 2018 - 2 bedrooms + Covered Terrace. 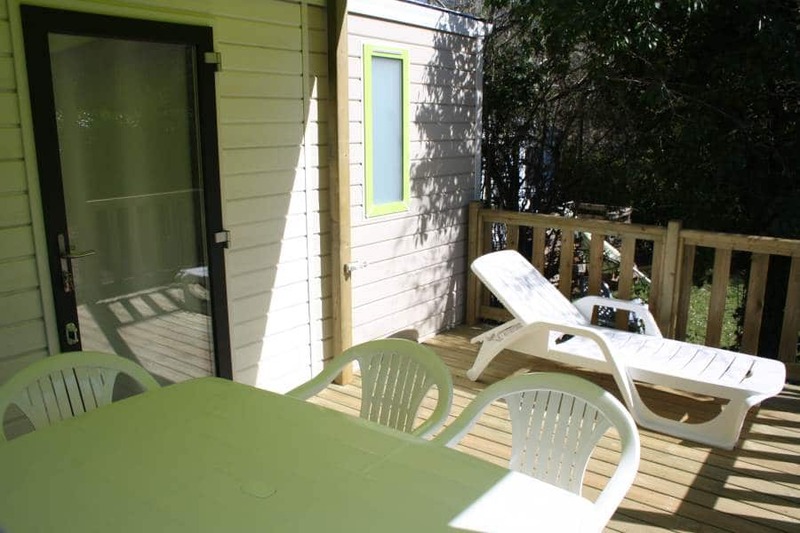 Surface with terrace covered 31m². 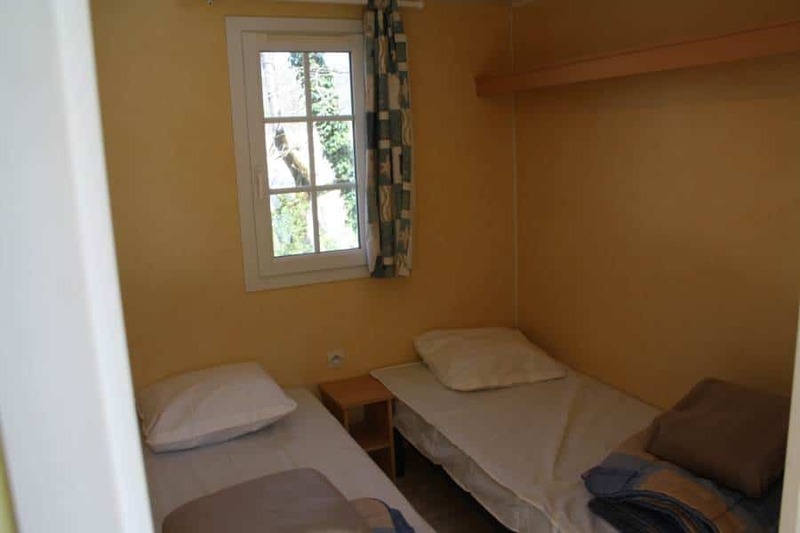 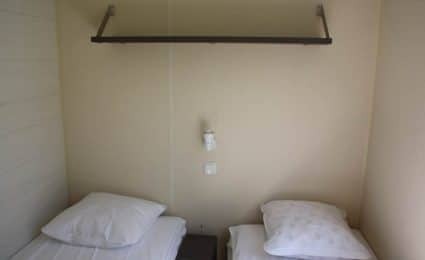 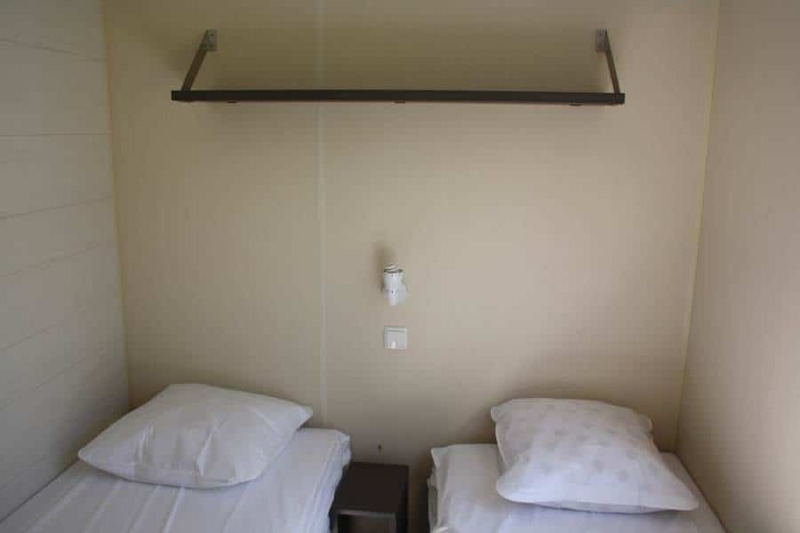 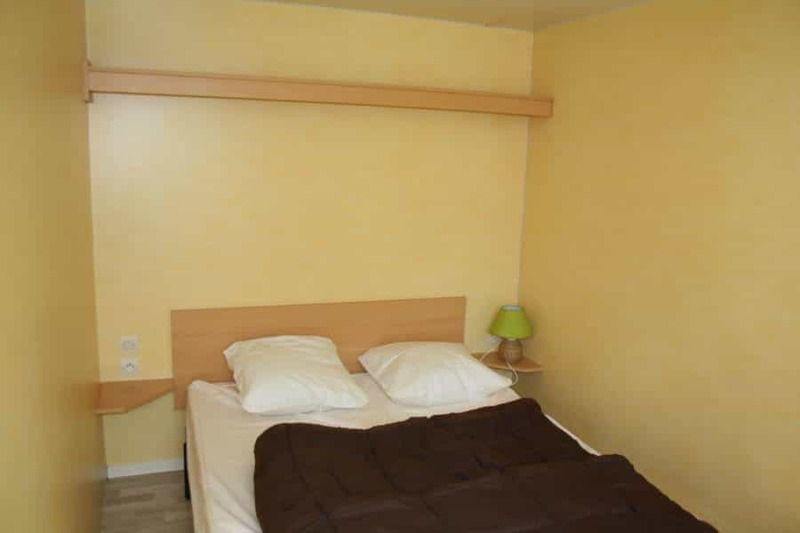 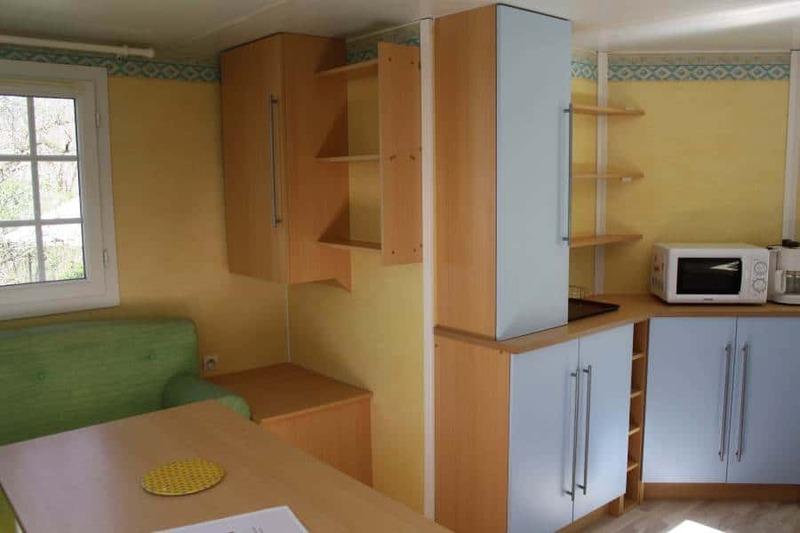 1 bedroom with double bed 140×190. 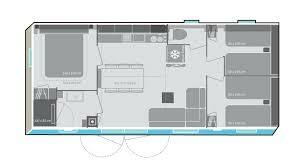 Mobile Home 734T - 2 Rooms + Covered Terrace. 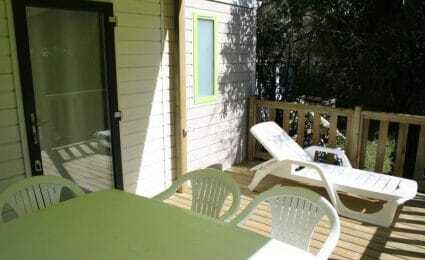 Surface 25 m² + terrace. 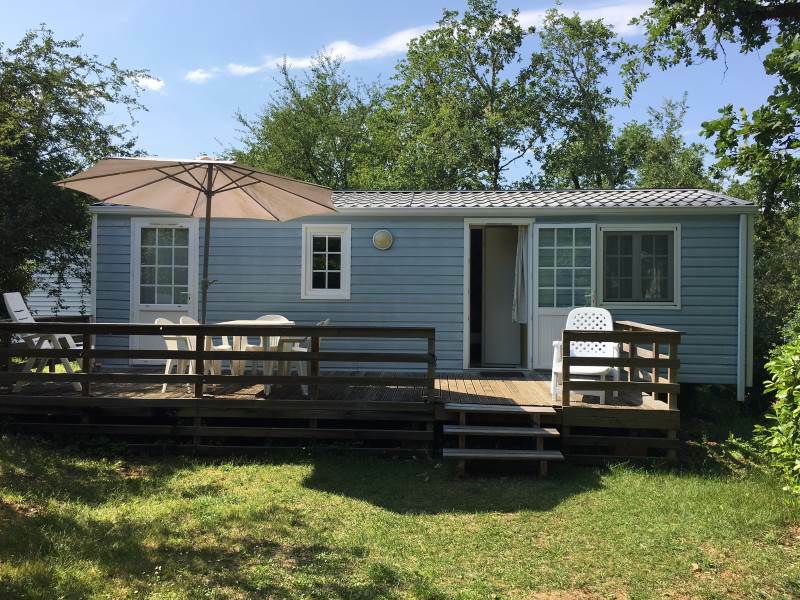 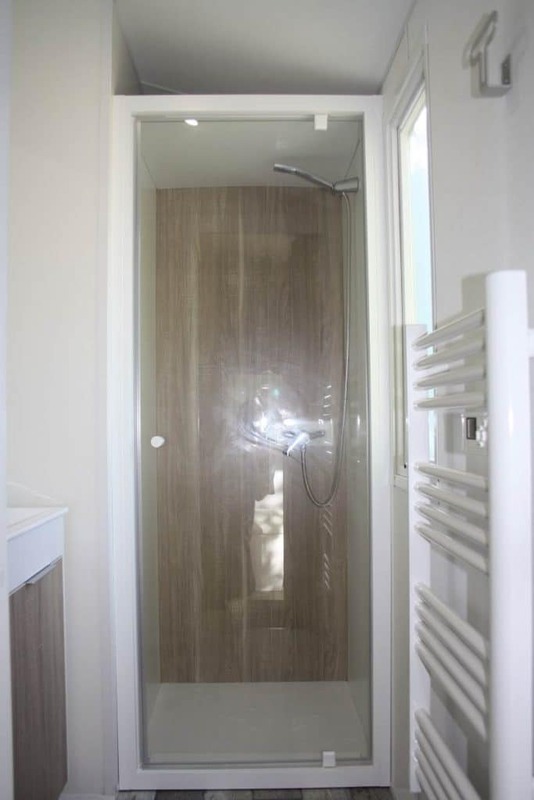 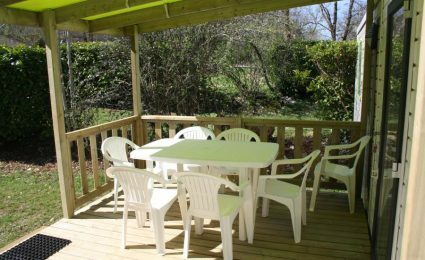 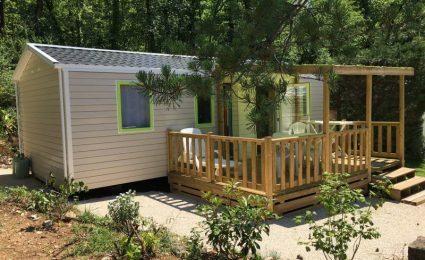 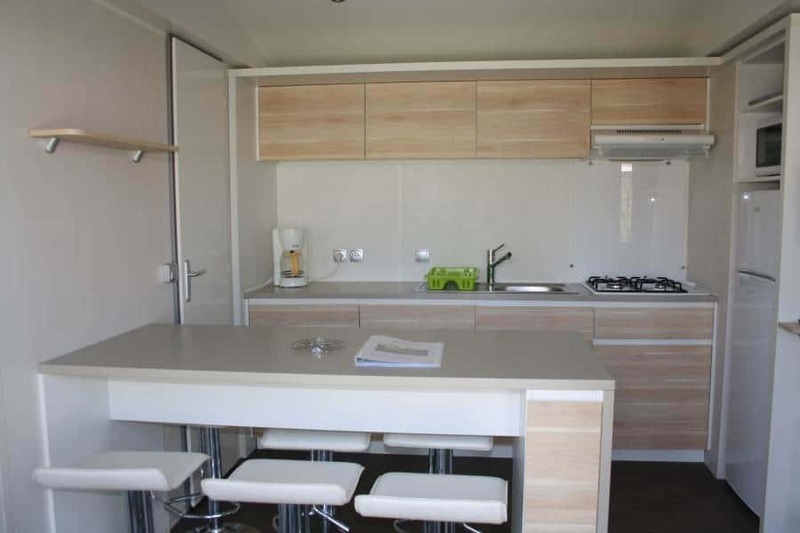 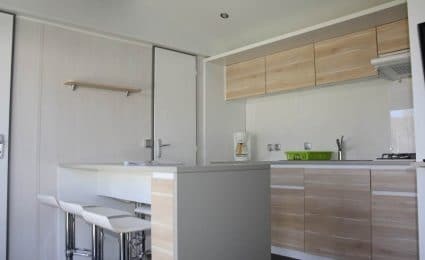 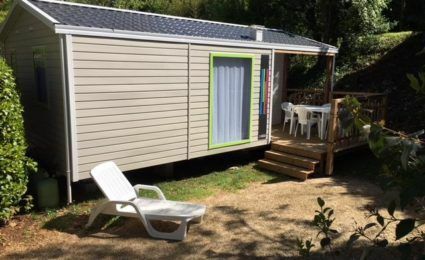 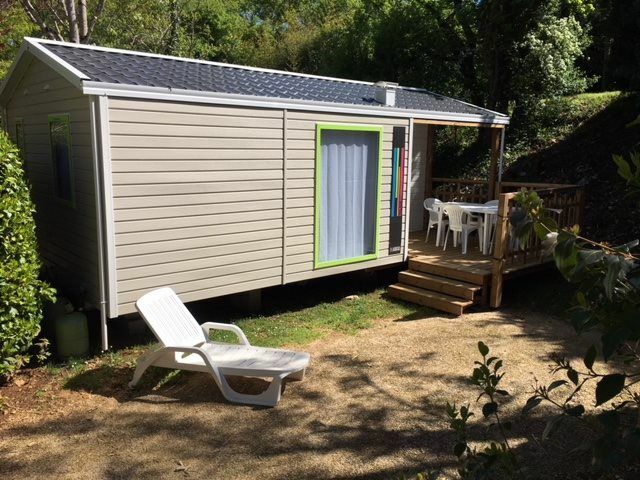 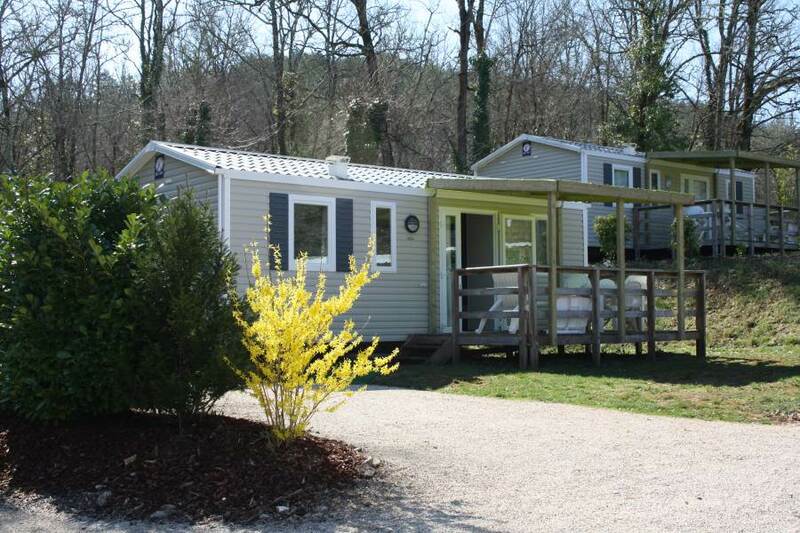 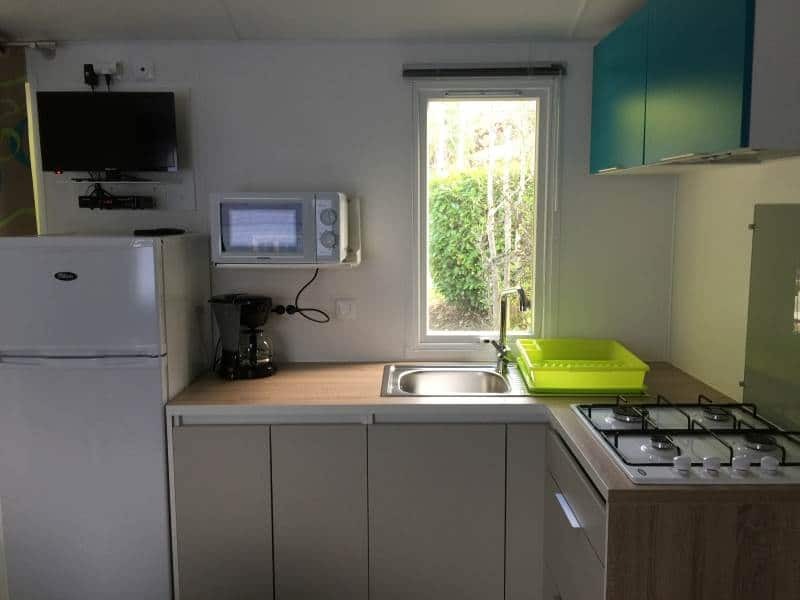 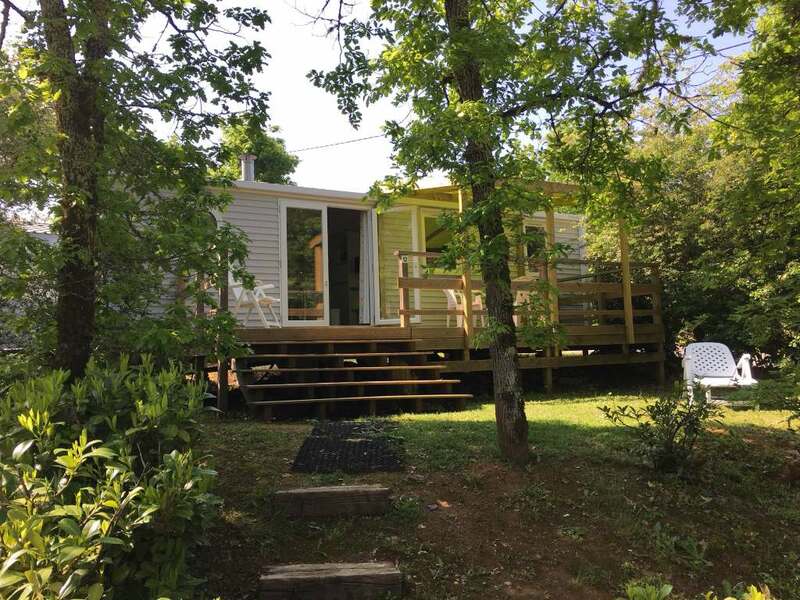 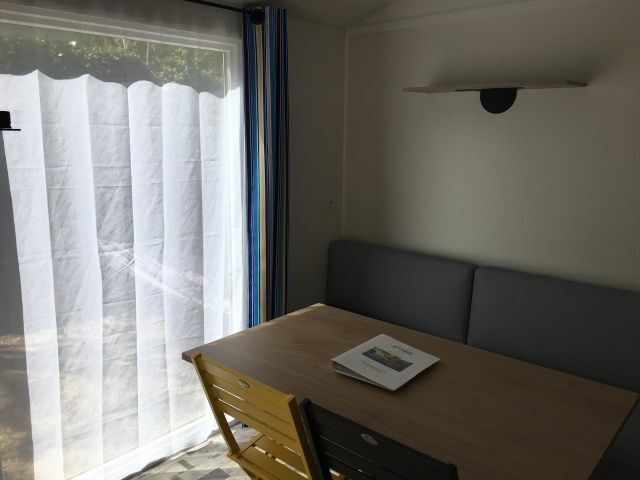 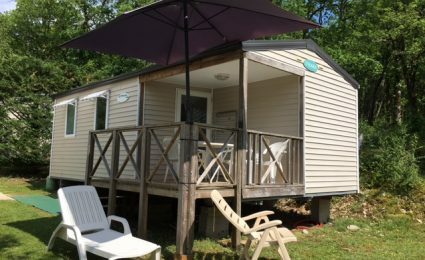 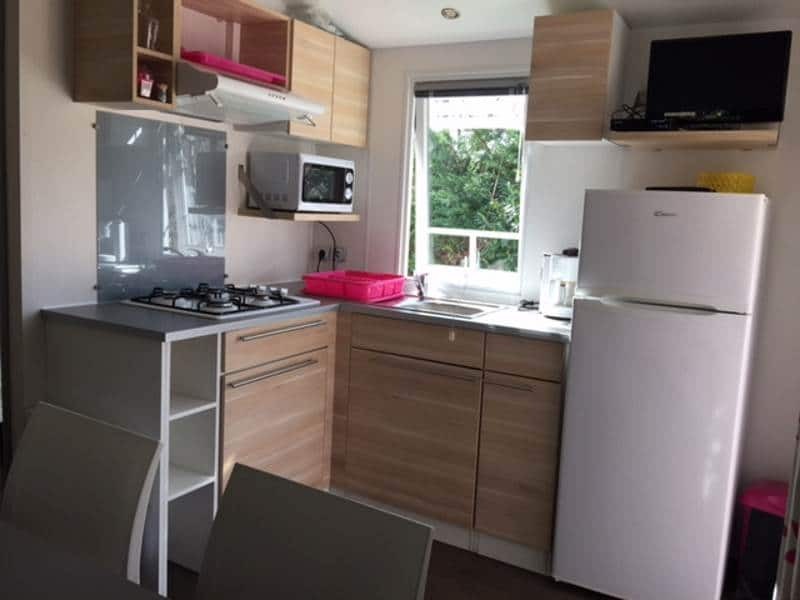 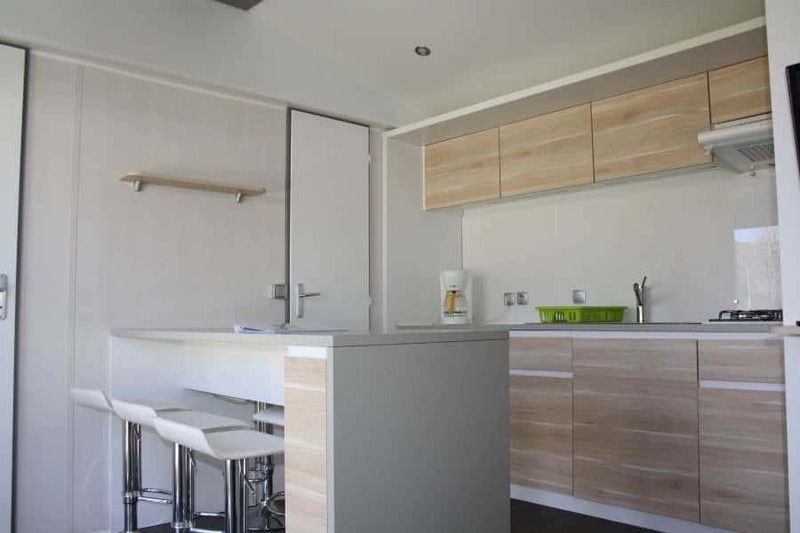 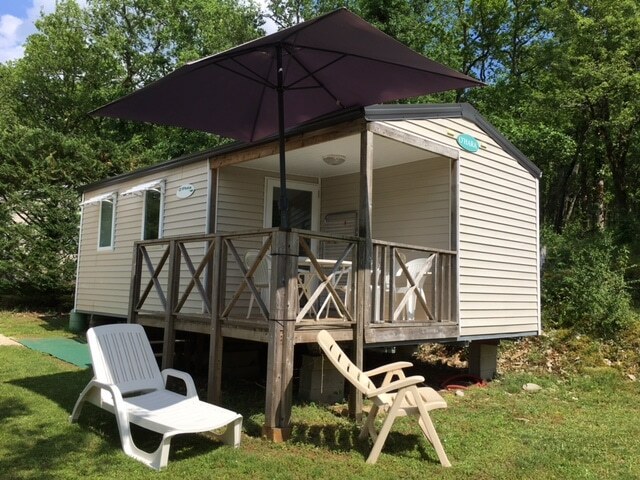 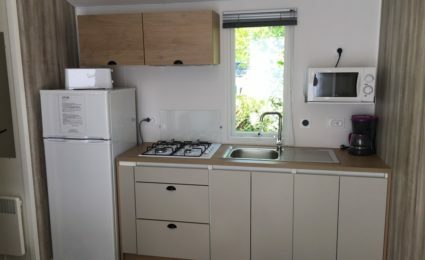 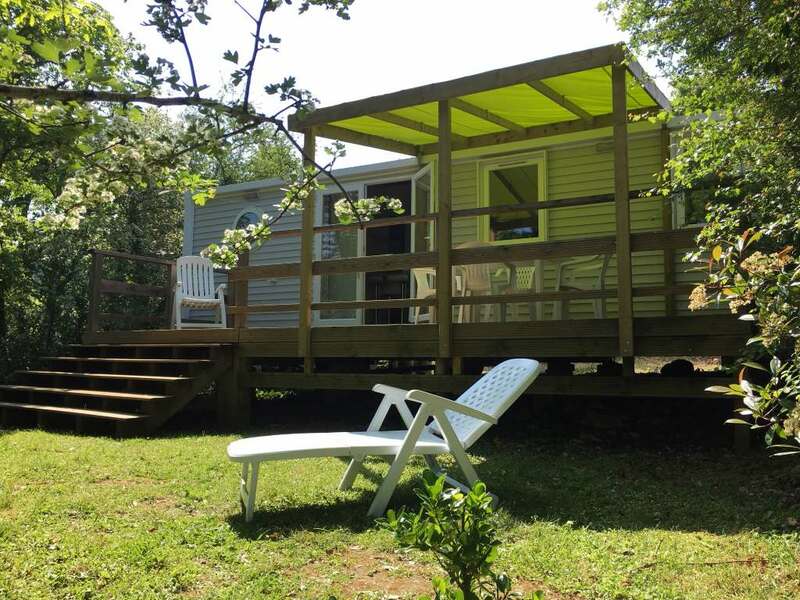 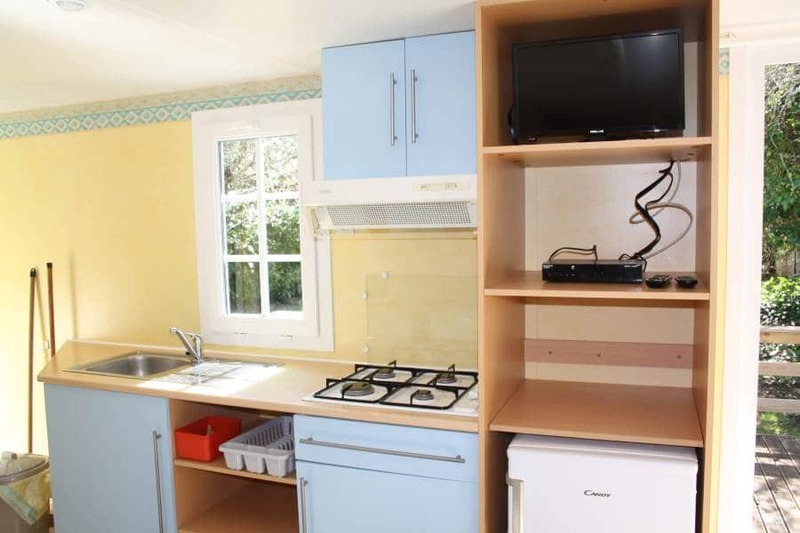 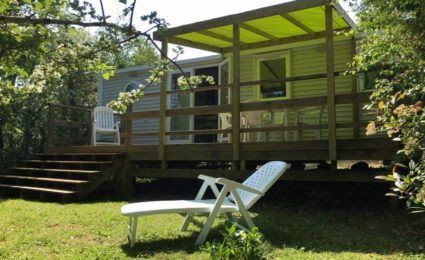 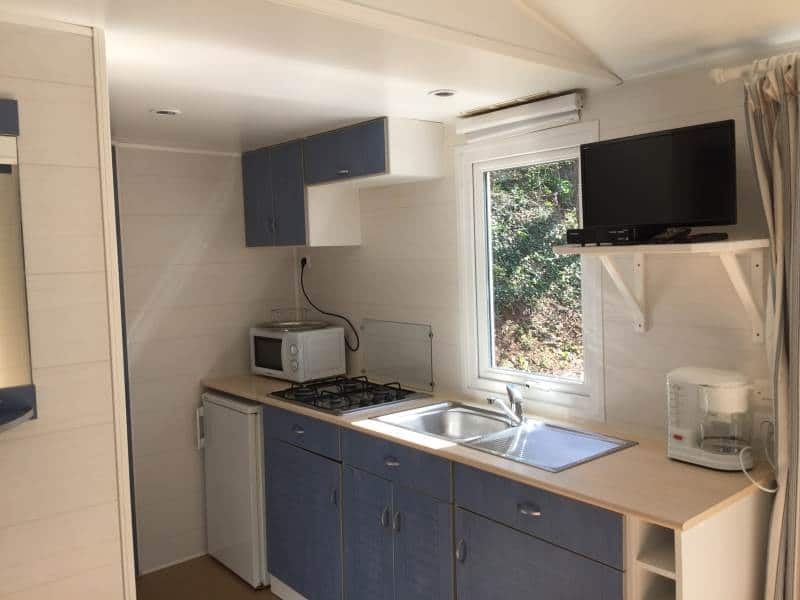 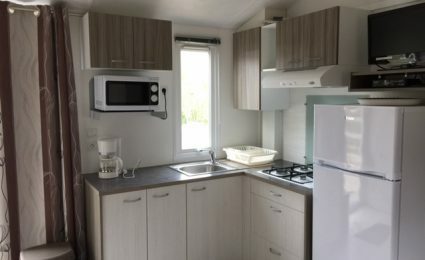 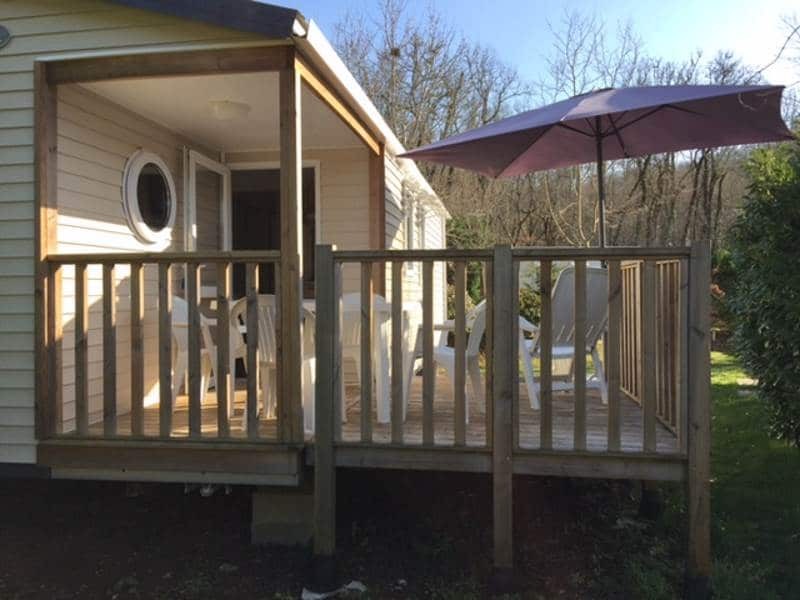 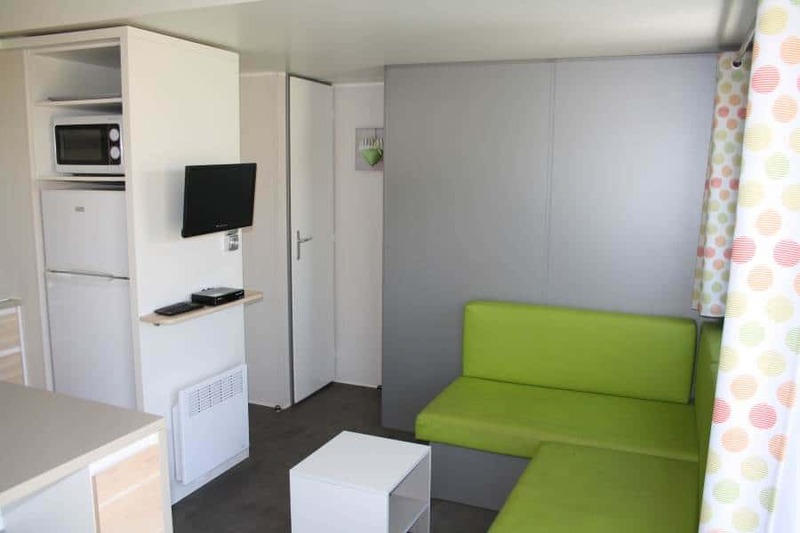 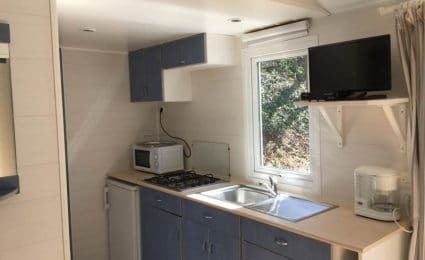 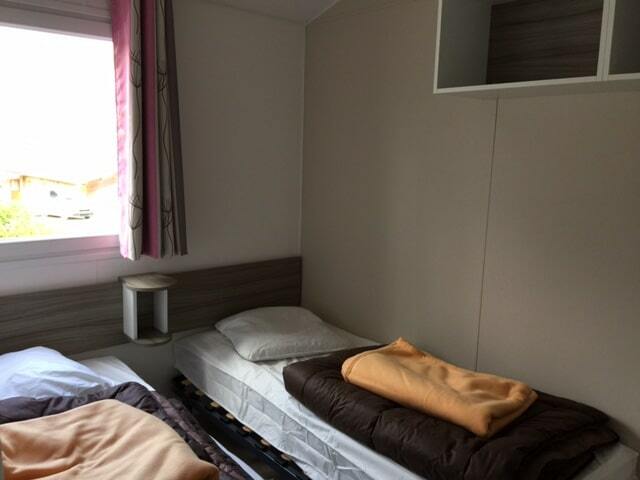 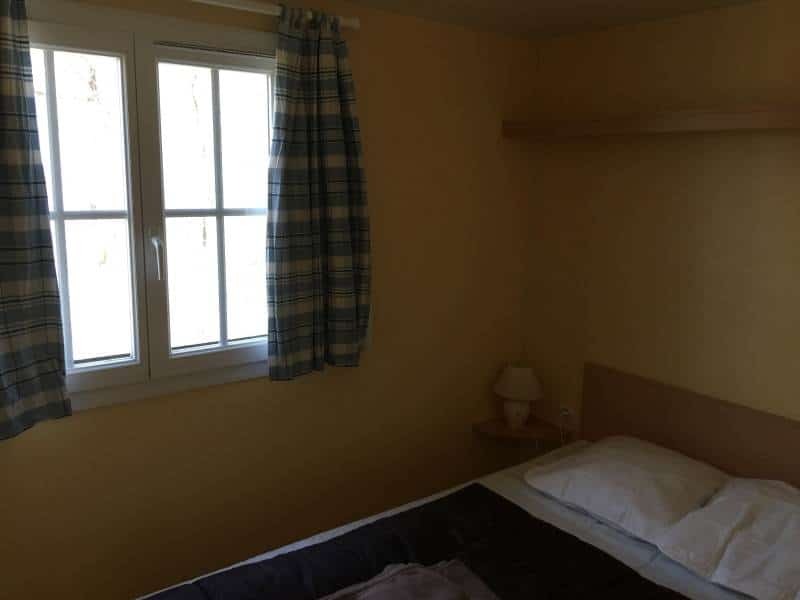 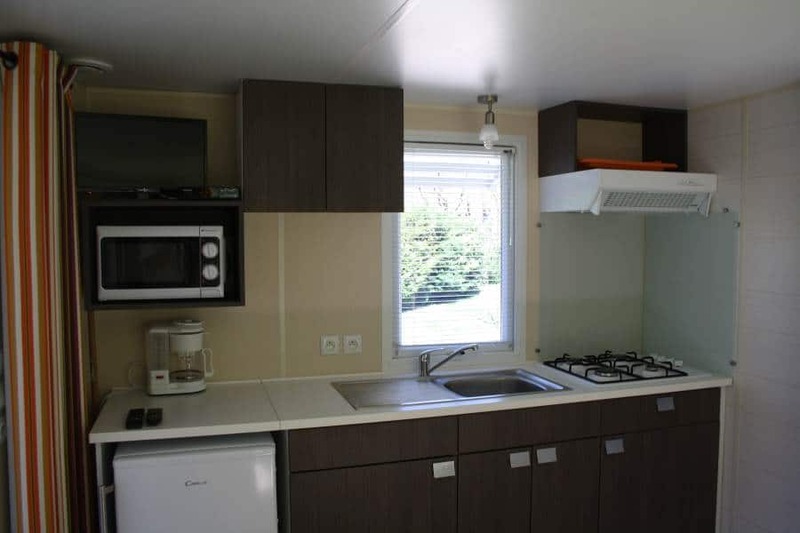 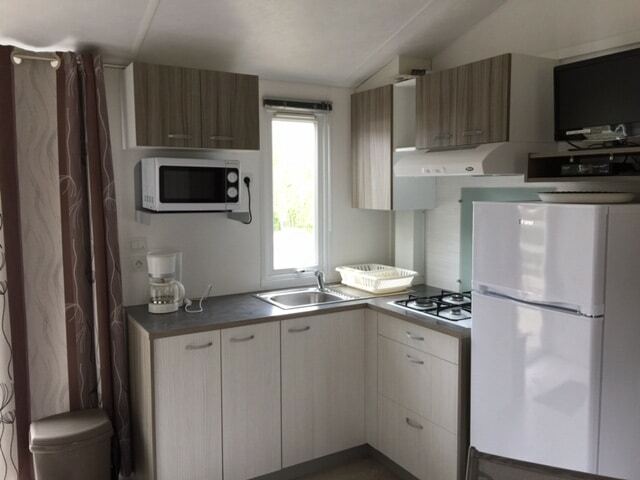 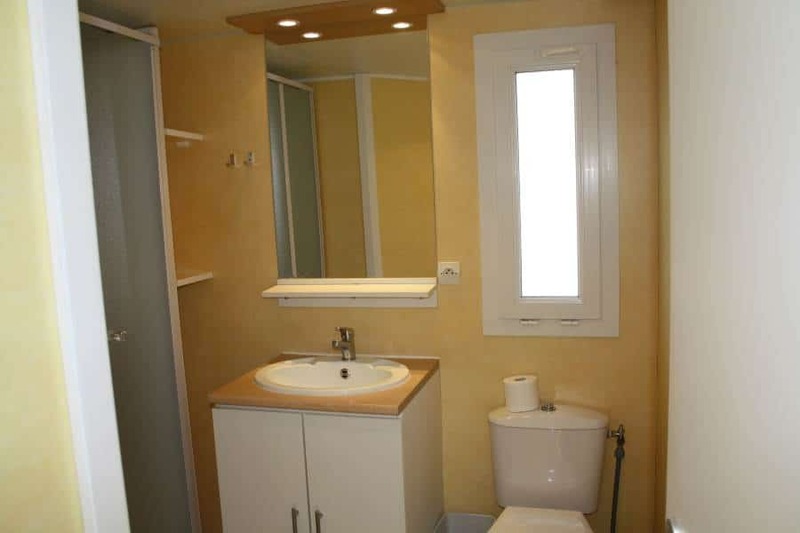 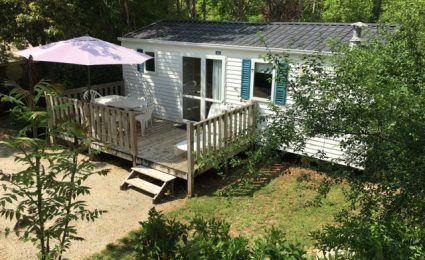 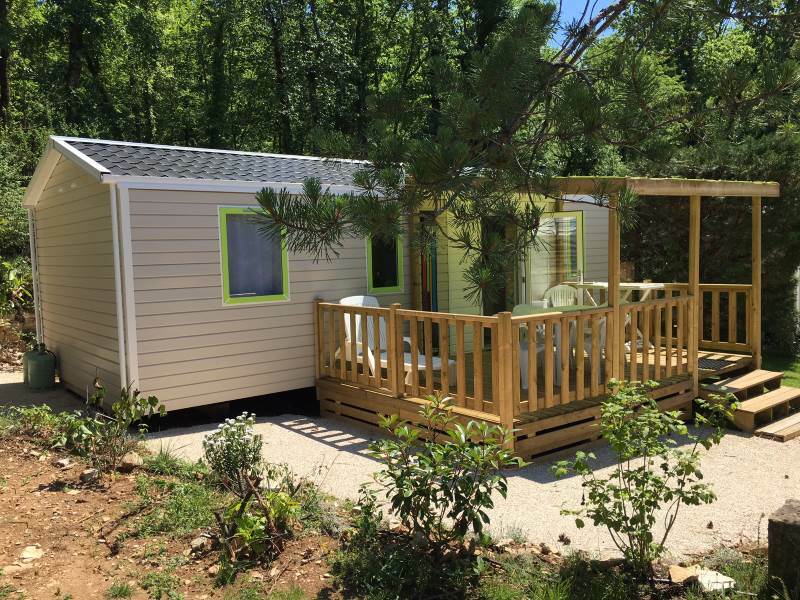 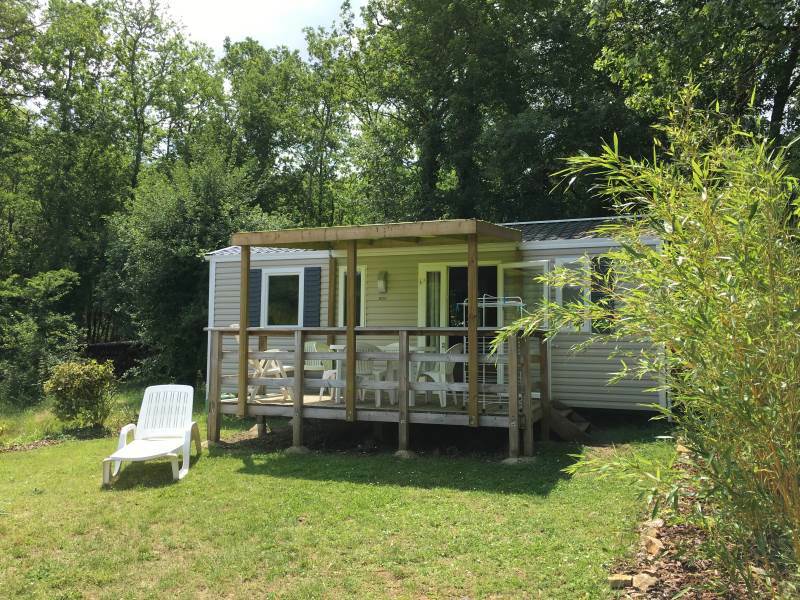 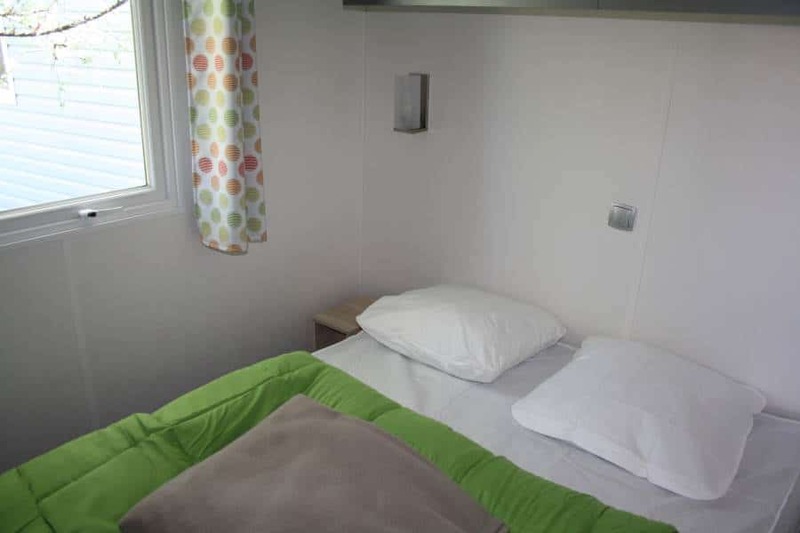 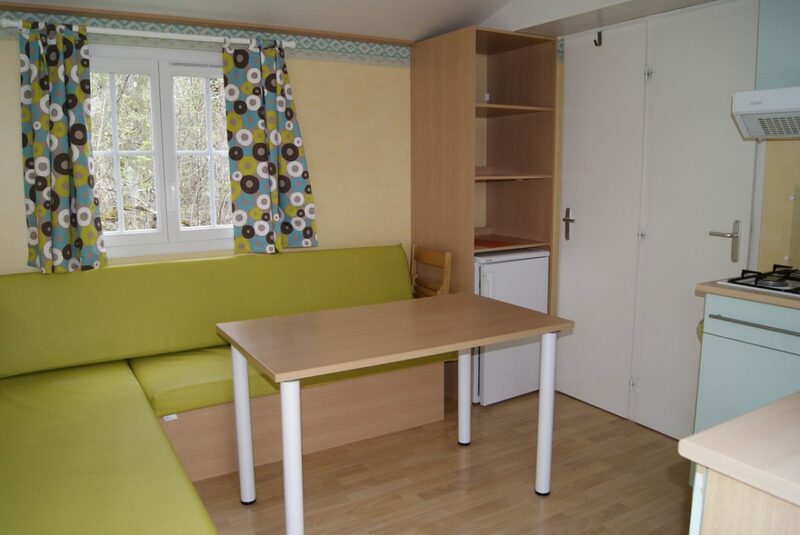 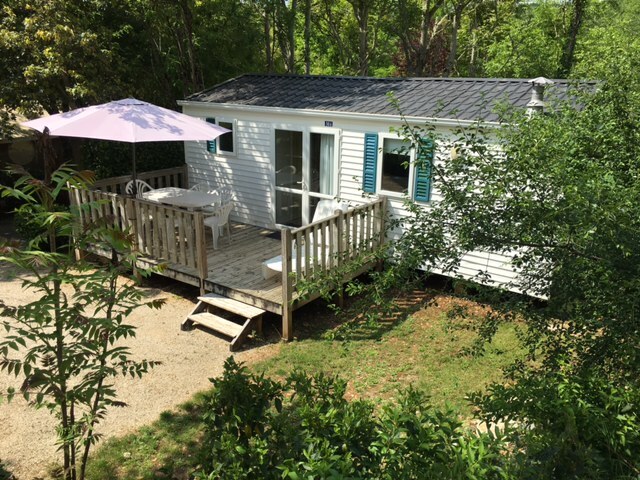 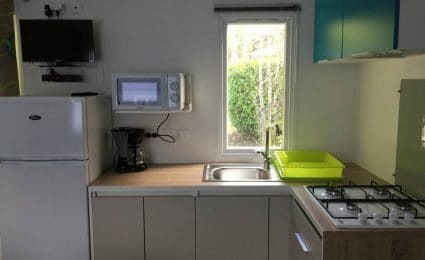 Mobile Home Calvi 25m² with 2 bedrooms + Outdoor Large Terrace. 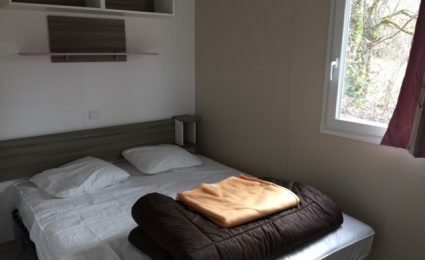 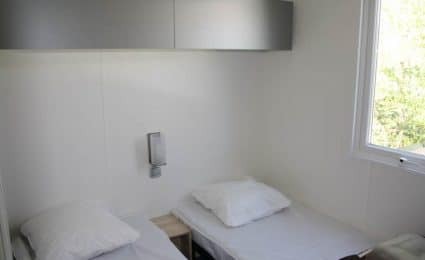 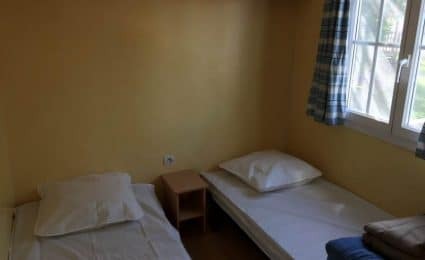 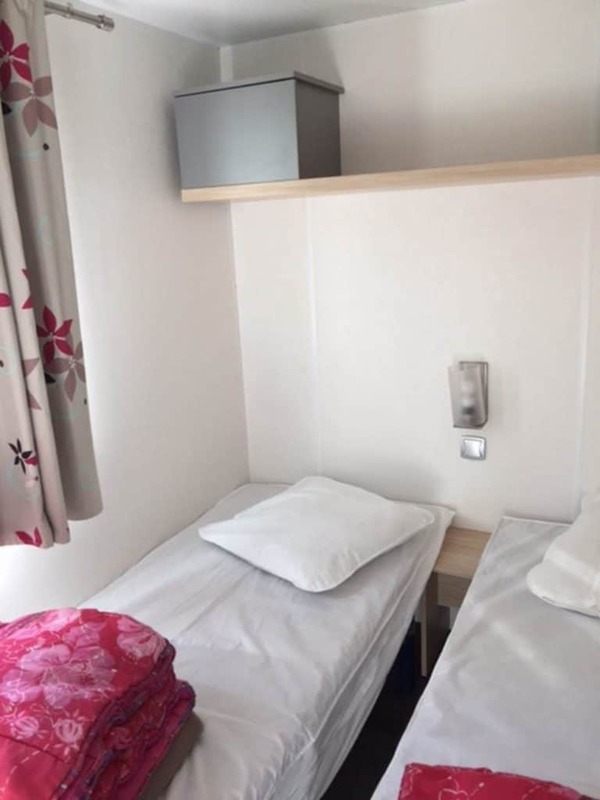 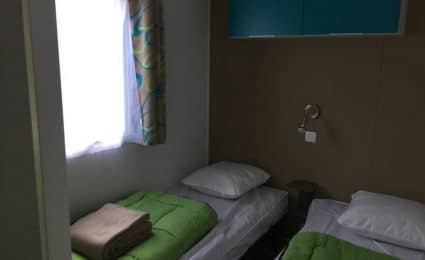 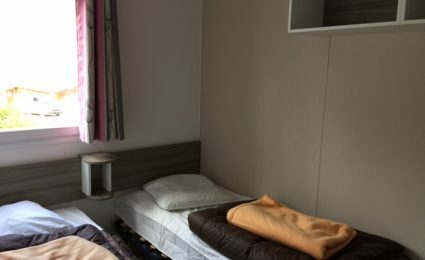 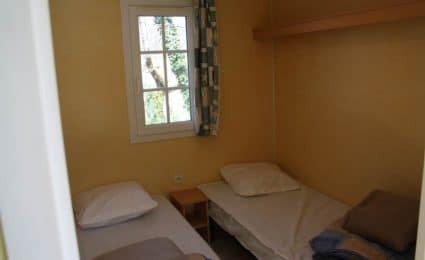 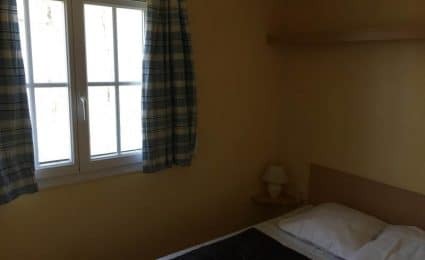 1 bedroom with double bed + place for baby bed. 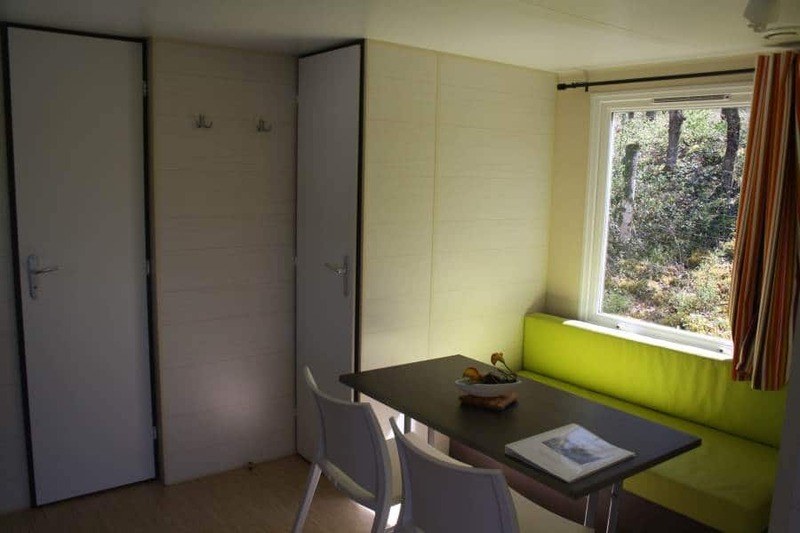 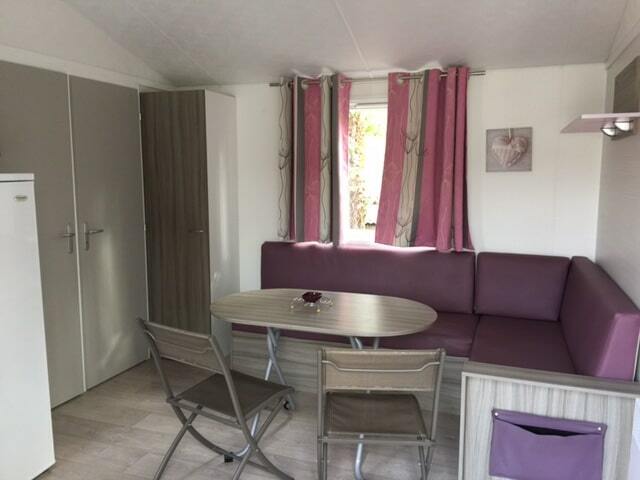 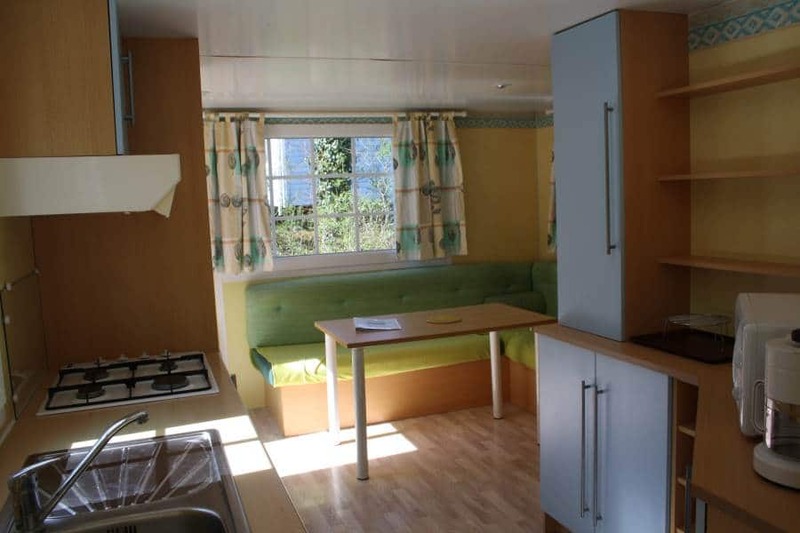 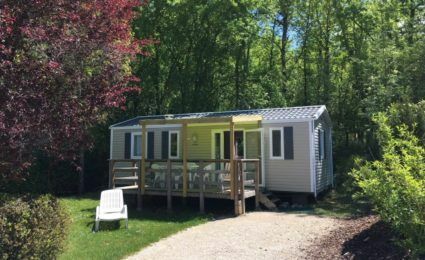 Mobile Home Antares - 2 bedrooms + Outdoor Terrace. 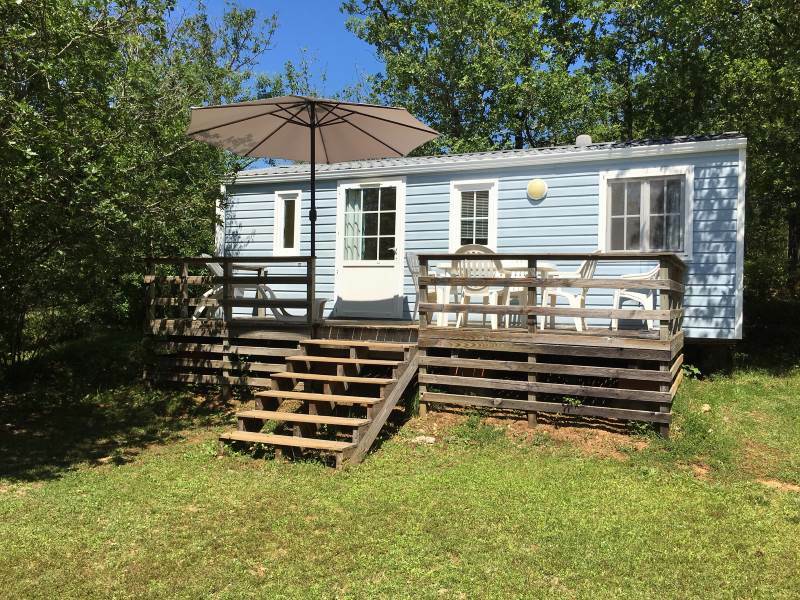 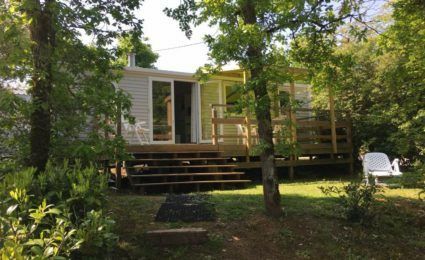 Mobile Home 734 - 2 bedrooms + Terrace. 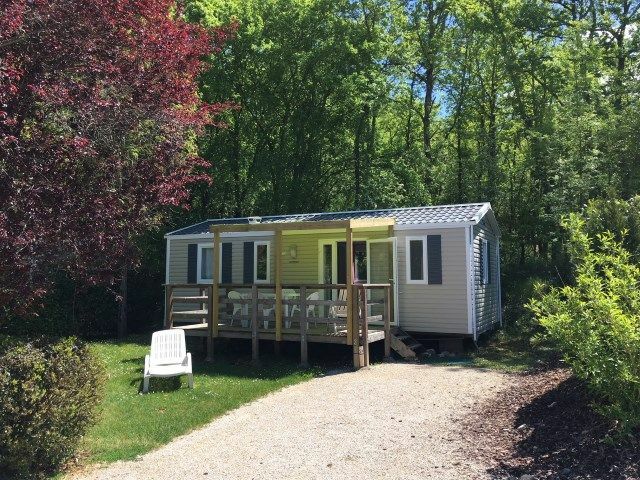 You are looking for unusual accommodation, discover our fully equipped lodges tents. Traditional camper, our camping car pitches by the river will make you happy. 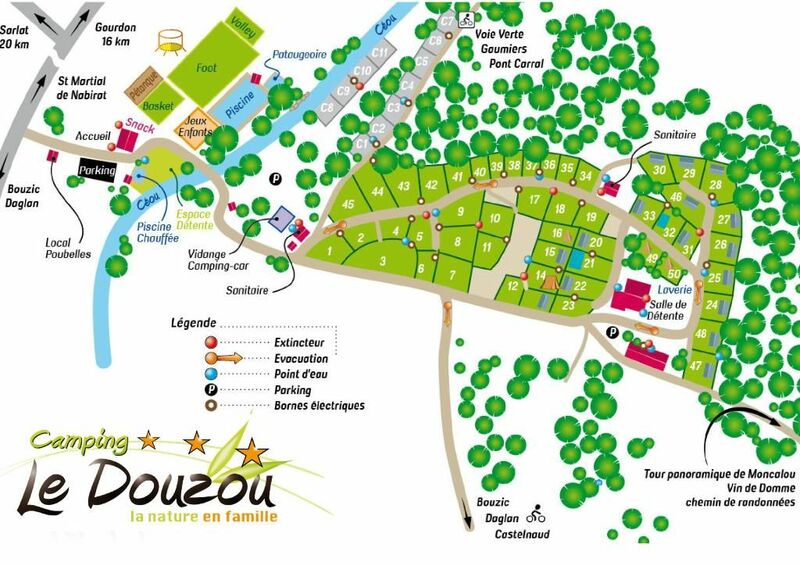 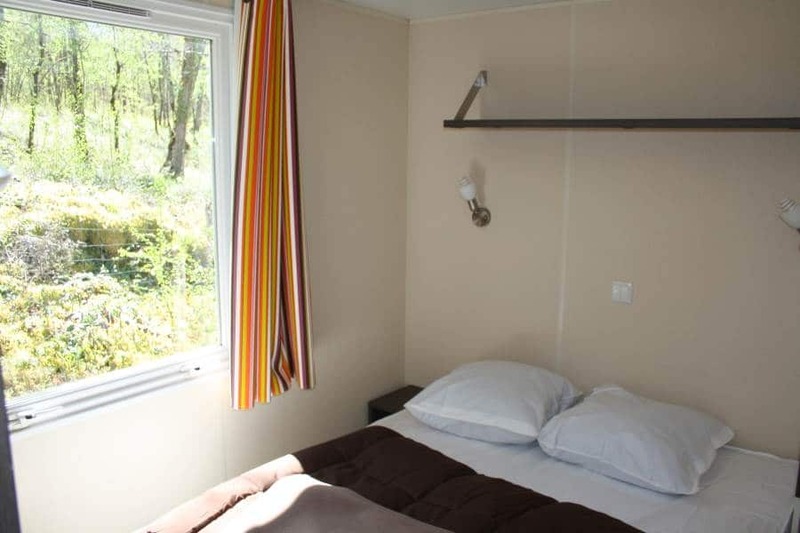 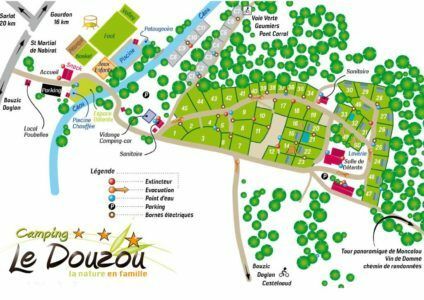 In tent or caravan, you will live a natural stay on our camping pitches located in the forest.